The Vanuatu Meteorology and Geo-hazards Department (VMGD) reported that a fissure eruption in the ESE part of the Ambrym summit caldera near the Lewlembwi crater (4 km SE of Marum) began at 0600 on 15 December, heralded by elevated seismicity detected by the seismic network and ash emissions visible in the webcam. A notice issued later that day by VMGD stated that lava flows and lava fountains were visible, and explosions were occurring. John Tasso, a local guide, visited the caldera a few hours after the new activity started and observed lava fountains from a fissure eruption; his video was posted to his website. The lava fountains were about 40 m high; lava flows spread to the E part of the caldera. Although partially obscured by a steam plume directly above the eruption site, infrared imagery from the Sentinel-2 satellite on 15 December showed lava filling much of the 500 x 900 m Lewlembwi crater and a lava flow almost as large a few hundred meters SW of that crater. VMGD raised the Alert Level to 3 and stated that the eruption was characterized as “small scale.” The eruption continued during 16-17 December, though reports on 17 December only described ongoing ash-and-gas emissions. On 15 November the Vanuatu Meteorology and Geo-hazards Department (VMGD) reported that the lava lakes in Ambrym’s Benbow and Marum craters continued to be active during October and November, and produced substantial and sustained gas-and-steam emissions. The Alert Level remained at 2 (on a scale of 0-5); the report reminded the public to stay outside of the Permanent Danger Zone defined as a 1-km radius from Benbow Crater and a 2.7-km radius from Marum Crater. On 22 August the Vanuatu Meteorology and Geo-hazards Department reported that the lava lakes in Ambrym’s Benbow and Marum craters continued to be active, and produced sustained and substantial gas-and-steam emissions. The Alert Level remained at 2 (on a scale of 0-5); the report reminded the public to stay outside of the Permanent Danger Zone defined as a 1-km radius from Benbow Crater and a 2.7-km radius from Marum Crater. On 7 June the Vanuatu Geohazards Observatory (VGO) reported that the lava lakes in Ambrym’s Benbow and Marum craters continued to be active, and produced sustained and substantial gas-and-steam emissions. The Alert Level remained at 2 (on a scale of 0-5); the report reminded the public to stay outside of the Permanent Danger Zone defined as a 1-km radius from Benbow Crater and a 2.7-km radius from Marum Crater. On 25 April the Vanuatu Geohazards Observatory (VGO) reported that the lava lakes in Ambrym’s Benbow and Marum craters continued to be active, and produced gas-and-steam emissions. The Alert Level remained at 2 (on a scale of 0-5); the report reminded the public to stay outside of the Permanent Danger Zone defined as a 1-km radius from Benbow Crater and a 2.7-km radius from Marum Crater. On 19 March the Vanuatu Geohazards Observatory (VGO) reported that, based on photos taken during February-March, the lava lakes in Ambrym’s Benbow and Marum craters continued to be active and produced gas-and-steam emissions. Visitors occasionally reported smelling volcanic gases and hearing explosions. The Alert Level remained at 2 (on a scale of 0-5); the report reminded the public to stay outside of the Permanent Danger Zone defined as a 1-km radius from Benbow Crater and a 2.7-km radius from Marum Crater. On 7 December Vanuatu Geohazards Observatory (VGO) lowered the Alert Level for Ambrym to 2 (on a scale of 0-5), noting that activity had stabilized by the end of November and was characterized by gas-and-steam emissions. Seismicity had also declined. The report reminded the public to stay outside of the Permanent Danger Zone defined as a 1-km radius from Benbow Crater and a 2.7-km radius from Marum Crater. 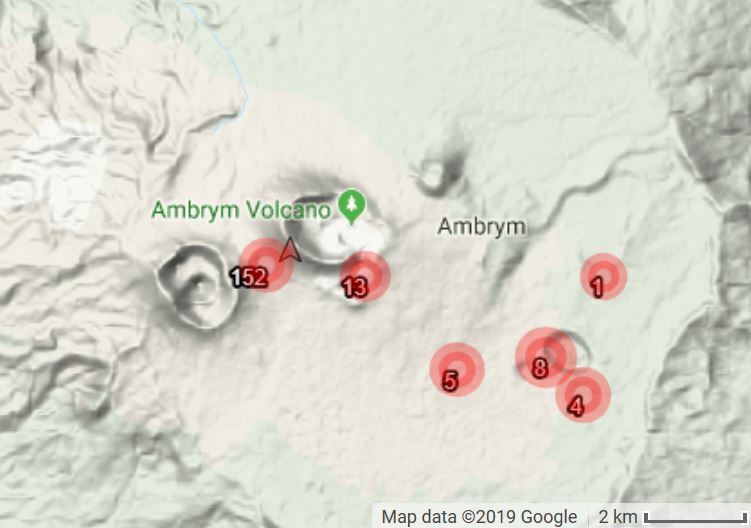 The Vanuatu Geohazards Observatory (VGO) reported that aerial observations of Ambrym on 24 and 30 September, and 1 and 6 October, and the analysis of seismic data, confirmed that minor eruptive activity within the caldera was characterized by hot volcanic gas and steam emissions. The Alert Level remained at 3 (on a scale of 0-5). Areas deemed hazardous were within a 2-km radius from Benbow Crater and a 3-km radius from Marum Crater. On 28 September the Vanuatu Geohazards Observatory (VGO) reported that minor eruptive activity continued at Ambrym. The Alert Level remained at 3 (on a scale of 0-5). Areas deemed hazardous were within a 2-km radius from Benbow Crater and a 3-km radius from Marum Crater. On 30 August the Vanuatu Geohazards Observatory (VGO) reported that “drastic changes” at Ambrym prompted an increase in the Alert Level from 2 to 3 (on a scale of 0-5). Areas deemed hazardous were near and around the active vents (Benbow, Maben-Mbwelesu, Niri-Mbwelesu and Mbwelesu), and in downwind areas prone to ashfall. According to a news article, a representative of VGO indicated that the Alert Level change was based on increased seismicity detected since the beginning of August but which became more notable on 25 August. Since monitoring of the volcano started around 20 years ago, the Alert Level had never been elevated past 2. The Wellington VAAC reported that a low-level ash emission from Ambrym was identified in satellite images on 3 April. On 27 May the Vanuatu Geohazards Observatory issued a statement reminding residents and visitors that Ambrym remained active; the Alert Level remained at 2 (on a scale of 0-5). Areas deemed hazardous were near and around the active vents (Benbow, Maben-Mbwelesu, Niri-Mbwelesu and Mbwelesu), and in downwind areas prone to ashfall. On 21 August the Vanuatu Geohazards Observatory issued a statement reminding residents and visitors that Ambrym remained active; the Alert Level remained at 2 (on a scale of 0-5). Areas deemed hazardous were near and around the active vents (Benbow, Maben-Mbwelesu, Niri-Mbwelesu and Mbwelesu), and in downwind areas prone to ashfall. On 22 July the Vanuatu Geohazards Observatory issued a statement reminding residents and visitors that Ambrym remained active; the Alert Level remained at 2 (on a scale of 0-5). Areas deemed hazardous were near and around the active vents (Benbow, Maben-Mbwelesu, Niri-Mbwelesu, and Mbwelesu), and in downwind areas prone to ashfall. On 18 May the Vanuatu Geohazards Observatory issued a statement reminding residents and visitors that Ambrym remained active. The Alert Level remained at 2 (on a scale of 0-5). Areas deemed hazardous were near and around the active vents (Benbow, Maben-Mbwelesu, Niri-Mbwelesu and Mbwelesu), and in downwind areas prone to ashfall. On 7 April the Vanuatu Geohazards Observatory issued a statement reminding residents and visitors that Ambrym remained active. The Alert Level remained at 2 (on a new scale of 0-5). Areas deemed hazardous were near and around the active vents (Benbow, Maben-Mbwelesu, Niri-Mbwelesu and Mbwelesu), and in downwind areas prone to ashfall. On 2 March the Vanuatu Geohazards Observatory reported that activity at Ambrym had slightly decreased but remained elevated. The Alert Level was lowered to 2 (on a new scale of 0-5). Areas deemed hazardous were near and around the active vents (Benbow, Maben-Mbwelesu, Niri-Mbwelesu and Mbwelesu), and in downwind areas prone to ashfall. On 8 December the Vanuatu Geohazards Observatory reported that observations and analyses of Ambrym conducted during November and early December showed that activity levels had slightly decreased. The Alert Level was lowered to 1 (on a scale of 0-4). VGO warned that the area in close proximity to the active vents (Benbow, Maben-Mbwelesu, Niri-Mbwelesu, and Mbwelesu) remained dangerous. On 10 November the Vanuatu Geohazards Observatory reported that activity at Ambrym remained elevated. The Alert Level remained at 2 (on a scale of 0-4). On 1 October the Vanuatu Geohazards Observatory reported a slight increase in activity from Ambrym. The Alert Level remained at 2 (on a scale of 0-4). On 11 September, the Vanuatu Geohazards Observatory reported increased seismicity from Ambrym and raised the Alert Level from 1 to 2 (on a scale of 0-4). 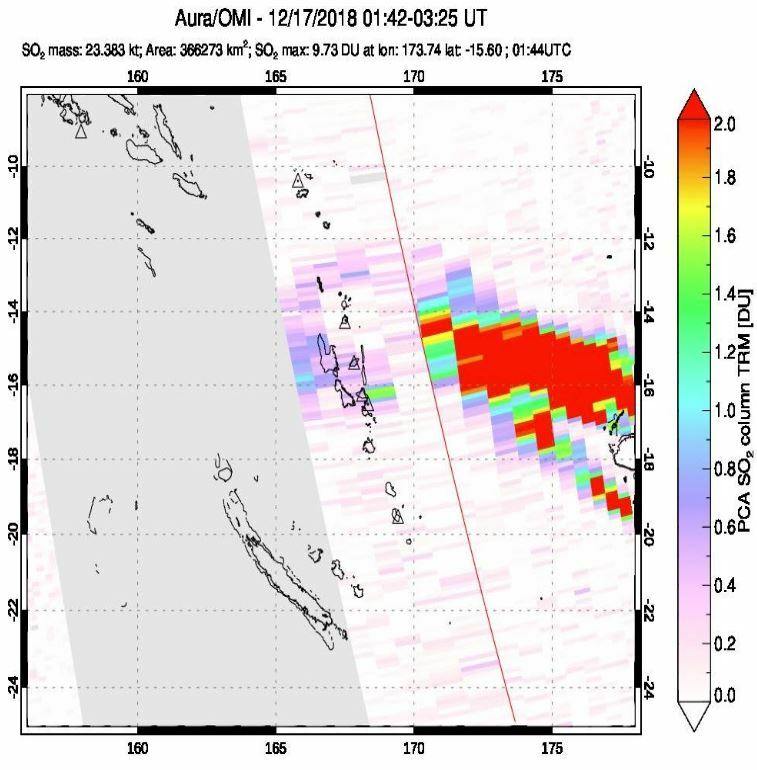 Based on pilot observations, analyses of satellite imagery, and information from the Vanuatu Geohazards Observatory, the Wellington VAAC reported that on 8 and 10 August ash-and-steam plumes from Ambrym rose to an altitude 6.1 km (20,000 ft) a.s.l. and drifted W and NW. Based on pilot observations and analyses of satellite imagery, the Wellington VAAC reported that ash plumes from Ambrym rose to an altitude of 2.4 km (8,000 ft) a.s.l. on 5 March. On 3 December, a diffuse plume from Ambrym, likely largely composed of sulfur dioxide, was visible on satellite imagery acquired by the Moderate Resolution Imaging Spectroradiometer (MODIS) and posted on NASA's Earth Observatory website. Based on information from the Port Vila airport tower, the Wellington VAAC reported that on 25 March an ash plume from Ambrym rose to an altitude of 2.1 km (7,000 ft) a.s.l. and drifted about 55 km S. The next day, a pilot reported that "smoke" rose to an altitude of 2.4 km (8,000 ft) a.s.l. Ash was not identified on satellite imagery. The Wellington VAAC reported that a pilot observed an ash plume from Ambrym on 3 May. The plume rose to an altitude of 1.8 km (6,000 ft) a.s.l. and drifted SE. Ash was visible on satellite imagery. The Wellington VAAC reported that an ash plume from Ambrym was visible on satellite imagery on 1 May. The altitude and direction of the plume were not reported. The Wellington VAAC reported that on 3 April pilots observed lava and ash emissions from Ambrym. Ash plumes rose to altitudes below 2.4 km (8,000 ft) a.s.l. According to a report from John Seach, during March an active lava lake was present in Ambrym's Mbwelesu crater. According to press reports, an eruption from Benbow Crater occurred on 10 February. Gases from the eruption caused acid rainfall on the SW portion of Ambrym Island, destroying most vegetation within 24 hours, contaminating water supplies, and burning some inhabitants. Jean-Luc Saos, Director of Mineral Resources for the New Hebrides government, reported a high concentration of HCl and sulfur compounds in the volcanic gases. Although heavy ashfalls have occurred in the area in the past, this is the first report of acid rains. Information Contacts: A.L. Dahl, S Pacific Commission, Noumea; Les Nouvelles Caledoniennes, Noumea. The following report, written by A. Macfarlane using information from J-L. Saos, supplements the previous report. "An increase in activity from Benbow Crater (in the SW portion of Ambrym's caldera) involving the copious emission of cinders, lapilli, and gases was first noted on 7 February. On the night of 10-11 February, ash and gas columns apparently combined with local rainstorms to produce a fallout of dilute sulfuric acid, which affected an area of some 90 km across SW Ambrym Island between and inland of the coastal villages of Baiap and Calinda (about 16 and 10 km SSW of Benbow Crater). The most extreme effects were observed in the Lalinda-Port Vato area (a 5 km zone along the coast) where there was extensive burning of pastures and yellowing of cash crops such as cocoa and coconut palms. In addition, the local population suffered from gastric upsets and from burning of the skin by contact with the acid rainwater. The local water supply was contaminated to the extent that pH values in cisterns had decreased to 5.2-5.5 when subsequently measured and were probably even lower at the time of the acid rains. "Owing to heavy cloud cover, it has not been possible to determine whether these eruptions mark a significant change in the configuration of vents within Benbow Crater." Information Contacts: A. Macfarlane, Geological Survey, Vanuatu; J.-L. Saos, Dept. of Mineral Resources and Rural Water Supply, Vanuatu. "On 8 March an ash-laden plume issued from Ambrym and reached an altitude estimated at 3,000 m (by aircraft altimeter), remaining visible 30 km or more downwind. The volcano's last violent activity had been reported 3 months earlier." Information Contacts: R. Stoiber, Dartmouth College. The crew of a Continental Airlines flight from Australia to Honolulu reported an eruption on 13 February at 0357, with ash clouds below 12 km altitude, moving SW. A NOTAM issued the next day at 2018 said that the eruption was from Benbow Crater, and forecast ash clouds to 10.5 km altitude, spreading ESE. A second NOTAM released 19 February at 0827 stated that volcanic activity had ceased. Geologists in Vanuatu reported that activity from Benbow was slightly stronger than usual for 2-3 days 12-14 February, but had since returned to normal. No damage was reported. Information Contacts: J. Latter, DSIR Geophysics, Wellington, New Zealand; C. Clark, Dept of Geology, Mines, and Rural Water Supplies, Port-Vila. On 31 April at 0730, the meteorological service in Wellington, New Zealand detected volcanic ash clouds near 16.1°S, 168.1°E on satellite images. The main cloud had an estimated diameter of 15-30 km, with streamers to 115 km NNE, and moved at a speed of ~30 km/hour. The plume height was estimated at ~6 km from an aircraft at 0350. The meteorological service in Darwin, Australia also located a steam/ash cloud on visible satellite images at 1030. NOAA infrared and visible images showed only a small cloud on 31 April at 1344 during clear weather. The following is a report from J.P. Eissen, M. Lardy, M. Monzier, L. Mollard, and D. Charley of ORSTOM (Nouméa and Port Vila). Description and history. "Ambrym, a large stratovolcano with a 15-km-wide caldera (figure 1), is one of the most active volcanoes of the New Hebrides arc, which includes Yasur (Tanna Island), Lopevi (Lopevi Island), and the shallow submarine volcano Karua (between Epi and Tongoa Islands). Figure 1. Geologic features of Ambrym caldera. The 1988 and 1989 lava flow paths have been modified after Monzier and Douglas (1989). Q1 = Tuvio volcanics (old northern Ambrym volcano), Q2 = older flank volcanics, Q3 = younger flank volcanics, Q4 = Tower Peak volcanics, Q5 = undifferentiated recent caldera and flank volcanics, Q6 = NE and E Marum basaltic flows and related old cones. The area shown is outlined on the index map (inset) of the main topographic features of Ambrym Island. B = Benbow, M = Marum (active cones), To = Tower Peak, Tu = Mt. Tuvio (old volcanic centers), E = Endu village, O = Otas village, S = Sevisi village. Maps modified after geological (New Hebrides Geological Survey, 1976) and pedomorphological (Quantin, 1978) maps. ". . . . In the historical period, at least five types of activity can be distinguished. From the most to least frequent, these are: 1) intra-caldera, intermittent, Strombolian-type activity with mild extra-caldera ashfalls, but without lava flows (occurs almost every year); 2) intracaldera eruption frequently preceded by lava lake formation in the crater — generally starts with emission of a Plinian column that produces extra-caldera ashfalls, followed by intra-caldera lava flows; 3) activity similar to (2) followed by lava overflowing from the caldera (1863 (? ), 1913-14, 1942 eruptions); 4) extra-caldera lava emission from fissures (1894, 1913, 1929, 1936 eruptions) — sometimes evolves toward 5) formation of pyroclastic cones, sometimes accompanied by lava flows (1888, 1915, 1929 eruptions). Several of these types of actvity have occurred consecutively in the different phases of a single eruption (as in 1913-14 and 1929, the two major Ambrym eruptions). "On 13 November 1986, an aircraft pilot reported an increase in activity at the volcano. Ash emission became significant 17 November, but activity decreased 19-20 November. A new cone formed (Cheney, 1986) 3 km E of the active Marum cone (figure 1) and produced an intra-caldera lava flow ~4 km long (Melchior, 1988). May 1988 activity. "On 27 May 1988, a lava lake ~50 m in diameter was observed in Mbwelesu's crater. Benbow was emitting white clouds whereas Marum and Mbwelesu were emitting dark grey clouds (Melchior, 1988). On 10 August, intracaldera lava flowed S more than 1.5 km from what appeared to be a new cone, but was possibly an extension of Mbwelesu (Cheney, 1988). The flow (still warm) extended ~5 km S (Charley, 1988). This eruption had ended by 23 August. April 1989 activity. "At 1000 on 24 April 1989, a pilot observed a large plume rising ~3,500 m above the volcano. A lava flow from the the 1988 cone was following the same path as the 1988 flow but was a few kilometers longer. It followed the creek near Endou village (figure 1) and may or may not have extended outside the caldera [but see 14:10]. About 1 km2 of Otas village was reported to be burned. On the night of 29 April, large areas of red glow were seen from boats cruising in the area, and winds carried ash NW. Young vegetation on the S flank was burned (possibly by acid rain), and rain water had a strong taste. Local inhabitants said that the eruption was normal for the volcano even though there were more loud roaring noises and small earthquakes than in 1986 or 1988. A local pilots' strike prevented further observation of the eruption, but on 10 May the volcano was still active." The eruption apparently stopped sometime before 14 May. References. Charley, D., 1988, Rapport de Mission à Ambrym en Aout 1988: Document ORSTOM, Port Vila, 5 p.
Cheney, C.S., 1986, New volcanic eruption near Endu, SE Ambrym: Geology Dept Memo, 24 November 1986, 1 p.
Cheney, C.S., 1988, Volcanic activity report, Ambrym and Epi: Geology Dept Memo, 17 August 1988, 1 p.
Melchior, A.H., 1988, Rapport de Mission de Reconnaissance Volcanologique Ambrym (25-28 May 1988) et à Tanna (14 May 1988): Document ORSTOM, Nouméa, 10 p.
Quantin, P., 1978, Archipel des Nouvelles-Hébrides: Atlas des Sols et de quelques Données du Milieu: Cartes Pédologiques, des Formes du Relief, Géologiques et de la Végétation; ORSTOM (18 sheets). Stephenson, P.J., McCall, G.J.H., Le Maitre, R.W., and Robinson, G.P., 1968, The Ambrym Island Research Project, in Warden, A.J., ed., New Hebrides Geological Survey Annual Report 1966: Port Vila, p. 9-15. Information Contacts: J. Eissen, M. Lardy, M. Monzier, ORSTOM, New Caledonia; L. Mollard, and D. Chaney, ORSTOM, Vanuatu; J. Latter, DSIR Geophysics, Wellington; S. Kusselson, SAB; J. Temakon, Dept of Geology, Mines, and Rural Water Supply, Port Vila. 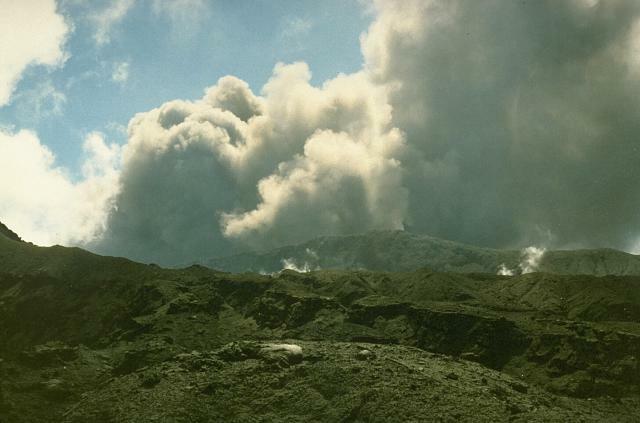 "After our previous report of the April-May 1989 eruption (14:04), activity apparently declined in early May to the normal level in the cone complex near Marum (figure 1). 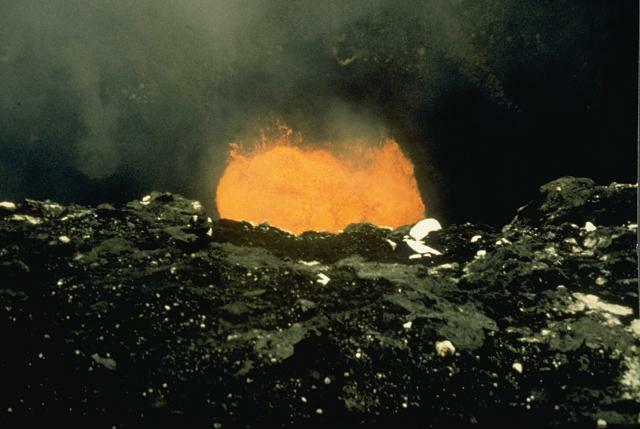 The previous report of a possible extra-caldera flow turned out to be erroneous, with the 1989 lava flows staying strictly confined inside the caldera. However, a pilot indicated that on 25 May a white plume was rising to 6,000 m, associated with an ash cloud that rose to 3,000 m, showing that the volcano remained active. "There was no further report until two of us visited the volcano 26-30 September, gathering complementary information about the recent eruptions and the present level of activity (Monzier and Douglas, 1989). The 1988 and 1989 lava flows originated from an area on the S flank of Marum formed by one crater and two cones, one of which was already visible during a 1943 photographic survey. The flows are basaltic aa, 1-3 m thick, highly vesicular and aphyric in 1988, and slightly vesicular and plagioclase sub-aphyric in 1989. The lava contours have been mapped; one of the 1989 flows partially covered a 1988 flow, while the other (E) one rejoined the 1988 flow in the SE sector and extended farther E, but stayed inside the caldera. Observation of the main craters was limited by poor weather. The Benbow pit was occupied by a gently bubbling lava lake, evident at night by a red glow visible from Sesivi, on the S coast of Ambrym. Marum was slightly degassing. The Mbuelesu pit was also occupied by a strongly bubbling lava lake but no large explosions were observed. The crater just S of Mbuelesu was in a fumarolic stage, as were the craters from which the recent flows originated. "The series of photographic surveys done periodically between 1943 and 1989 allows us to compare the evolution of the morphology of the craters (figure 2). Benbow, source of the major historic eruptions (figure 3), does not show any major morphological changes. In contrast, the morphology of Marum and adjacent cones changed substantially during this period. In 1943, Marum and its eastern neighbor Mbuelesu were both clogged with detrital material. Note that the small '892' cone, from which the recent flows originated, already existed in 1943. In 1953, Marum resumed its activity (Eissen, Blot, and Louat, 1991). On the 1954 photos, one new crater ('1953') underlain by fumaroles had formed across the edges of Marum and Mbuelesu Craters. Two smaller cones were also visible S of the 1953 crater. On the 1972 photos we can note: 1) the opening of a gently smoking pit in the center of Marum Crater; 2) the enlargement and division of 1953 crater, inactive at this time; 3) the formation of a new active crater S of 1953 crater, at the site of the two small cones visible in 1954. 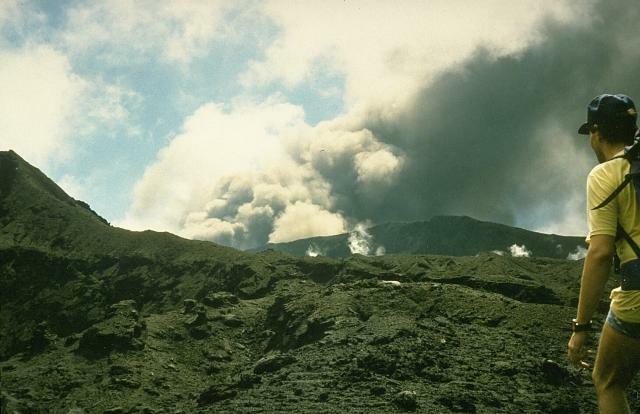 In 1986, the central pit of Marum and the W part of the 1972 double crater had merged and were slightly smoking. The E part of the 1972 double crater had enlarged at Mbuelesu and was strongly active and smoking. The 1989 situation is described above. Figure 2. Morphological evolution of the main intra-caldera craters of Ambrym from aeriel photographic surveys done in 1943 (US Air Force), 1954 (Institut Géographique National), 4 August 1972 (Royal Air Force), and 22 September 1986 (Royal Australian Air Force), and from ground observations 27-28 September 1989 (Monzier and Douglas, 1989). Symbols: 1 = volcanic cone with detrital filling (dots); 2 = lava flow; 3 = plume (white or gray); 4 = fumaroles. Figure 3. Tentative chronology of historical eruptions of Ambrym (Eissen and others, 1991). The 1774 report of activity is from Captain Cook. The 1850-1950 period is based on miscellaneous reports, mainly about extra-caldera eruptions, the only ones that are a significant threat to the local population. 1950-80 observations were by the New Hebrides Geological Survey, before Vanuatu's independence on 1 August 1980. Levels of activity: 1 = low, without precise details; 2 = high, with heavy ashfalls and/or lava lake; 3 = eruption with intra-caldera flow(s); 4 = eruption with lateral extra-caldera flows. "Thus, whereas Benbow has remained almost unchanged morphologically during the last 46 years, Marum and its adjacent craters strongly evolved during the same period, and recent activity seems concentrated in this area, restricted to the caldera. Although testimony is fragmental since 1980, strong activity seems to have resumed, the presence of two lava lakes indicating that the magma column is presently very high. Ambrym has had at least seven eruptions accompanied by extra-caldera lava flows, sometimes with resulting destruction and casualties. Part of the population has been evacuated several times (in 1913-15, 1929, and 1951) on adjacent islands. Careful study, observation, and eventually monitoring of this volcano should be encouraged to help prevent further destruction due to extra-caldera lava flow(s) that could reasonably be expected within the next few years." References. Eissen, J.P., Blot, C., and Louat, R., 1991, Chronology of the historic volcanic activity of the New Hebrides Island Arc from 1595 to 1991: ORSTOM Rapports Scientifiques et Technique, Sciences de la Terre, Géologie-Géophysique, no. 2, 69 p.
Monzier, M., and Douglas, C., 1989, Rapport de Mission à Ambrym (Vanuatu) du 26 au 30 Septembre 1989: Rapport de Mission Géologie-Géophysique no. 10, Document ORSTOM Nouméa, 30 p.
New Hebrides Geological Survey, 1976, Geology of Pentecost and Ambrym: 1:100,000, Sheet 6. Quantin, P., 1978, Archipel des Nouvelles Hébrides; Atlas des Sols et de Quelques Donées du Milieu: Cartes Pédologíques (01:50,000-1:100,000), des Formes du Relief, Géologiques et de la Végétation (01:100,000-1:250,000), 18 feuilles et 11 notices; ed. ORSTOM. Information Contacts: J. Eissen, M. Lardy, and M. Monzier, ORSTOM, New Caledonia; C. Douglas and L. Mollard, ORSTOM, Vanuatu. The Vanuatu arc was visited by an ORSTOM mission 5-18 September. The following is modified from their report in the LAVE Bulletin. Thick puffs of ash rose several hundred meters, and scattered blocks were ejected, from a vent 200 m below the rim of Niri Tamo, which formed adjacent to Mbuelesu crater in 1989 (14:10). The approach to the crater was sprinkled with blocks 10 cm to 1 m in diameter. One block, 2 m in diameter, was located near a possible new crater (Niri Taten) that was S of Mbuelesu, near the source of the 1988 lava flows and [~500 m] from Niri Tamo. A zone of intense degassing, with temperatures of at least 625°C, occurred within Niri Taten. Mbuelesu appeared more elongate to the NE than represented on 1989 maps and no longer contained a lava lake. One vent, sounding like a reactor, violently emitted ash, gas, lava blocks, and fragments. The plume rose vertically at 30 m/s, and projectiles frequently landed beyond the rim of the crater. Benbow crater emitted a strong bluish plume, suggesting a significant SO2 content. Further Reference. Eissen, J.P., Monzier, M., Robin, C., Picard, C., and Douglas, C., 1990, Report on the volcanological field work on Ambrym and Tanna Islands (Vanuatu) from 2 to 25 September 1990: Rapport Missions Sci Terre Geologie-Geophysique – ORSTOM (Noumea), no. 22, p. 1-22. Information Contacts: M. Lardy, ORSTOM, New Caledonia; B. Marty, CNRS, France; LAVE. The control tower at Bauerfield airport (serving Port Vila, ~150 km SSE of Ambrym), reported a 2-km-high ash cloud stretching ~50 km from Marum Crater on 10 June. Information Contacts: C. Mortimer, Dept of Geology, Mines, and Rural Water Supply, Vanuatu. "Aerial surveys on 13 and 24 July (VANAIR flights) showed puffs of gas and ash rising several hundred meters above Mbuelesu crater, and weak degassing from Benbow crater. Mbuelesu's lava lake, ~100 m in diameter and very deep in the crater, was still present. Activity has remained more or less constant since 1990, and no new lava flows have been observed since 1989." Information Contacts: C. Robin and M. Monzier, ORSTOM, New Caledonia; M. Lardy and C. Douglas, ORSTOM, Vanuatu; C. Mortimer, Dept of Geology, Mines, and Rural Water Supply, Vanuatu; J. Eissen, ORSTOM, France. During an aerial reconnaissance on 7 December 1994, activity was at normal levels with lava lakes present in both Benbow and Marum craters. 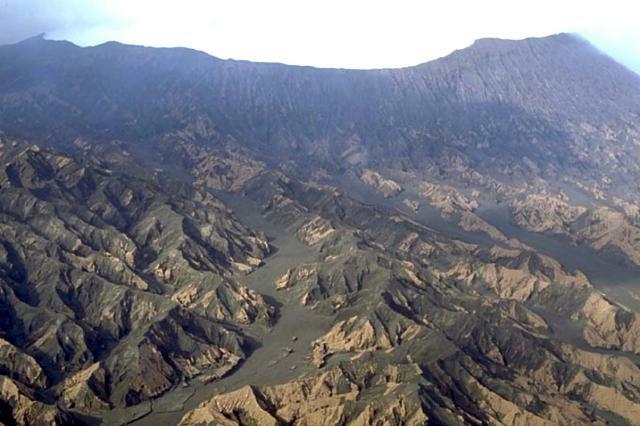 An intermediate-depth earthquake (185 km) occurred under Ambrym on 26 April 1994. Regular monitoring is done with a seismic station on Ambrym that transmits data via ARGOS satellite to the ORSTOM office in Port Vila. Information Contacts: M. Monzier, ORSTOM and Vanuatu Dept of Geology, Mines and Water Resources, Vanuatu. A visit to the summit caldera on 8-9 July did not permit an approach to the lava lakes in the Benbow and Marum craters due to poor weather. An overflight on the night of 20 July permitted observations of surface bubbling in Marum's lava lake. Two other overflights, on 21 and 22 July, allowed observation of activity in both lakes for several minutes. During these observations, the surface of the Benbow lake was fairly calm. However, Marum's lava lake, ~100 m in diameter, exhibited occasional explosions that threw glowing magma fragments some meters above the surface; bubbling was clearly visible from the airplane. Information Contacts: Henry Gaudru, C. Pittet, C. Bopp, and G. Borel, Société Volcanologique Européenne, C.P. 1, 1211 Genève 17, Switzerland (URL: http://www.sveurop.org/); Michel Lardy, Centre ORSTOM, B.P. 76, Port Vila, Vanuatu. During 5-13 August 1997, a team from the Société de Volcanologie Genève (SVG) observed Ambrym caldera and deployed an infrared (1.55 µm wavelength) optical pyrometer (Optix-G, Keller GMBH., Ibbenburen-Lagenbeck). Temperatures of lavas were estimated from the pyrometer by measuring emissivity factors of lavas heated to known temperatures in an oven. In some cases comparisons were also made with a thermocouple on the floor of Marum crater (contact the authors regarding procedures and results). At Benbow cone, most activity, including lava fountaining, occurred inside the S part of the crater. A deep crater in the cone's N flank emitted a large amount of hot, very concentrated gas. The crater bottom was not visible; however, strong night glow revealed the proximity of magma. At Marum cone, three different craters were active during the SVG visit. At Mbwelesu, the main crater, two closely spaced openings full of lava were visible from the rim. The lava surface was continuously overturned by fountains that were tens of meters high. The maximum temperature of the chimney opening was estimated with the optical pyrometer at 910°C. The pyrometer measurement was taken on the NNE side of the crater rim under conditions of good visibility and strong degassing. At Niri Mbwelesu, a secondary crater close to Mbwelesu's rim, strong degassing was observed. Although the crater was often full of vapor, occasionally the bottom was visible. A small, elongated lake surrounded by fumaroles was seen in the crater near a glowing opening that was emitting pulses of hot gas; however, magma was not directly observed. Inside Niri Mbwelesu Taten, a small collapse pit (169 x 185 m; 140 m deep) to the S of Niri Mbwelesu, Strombolian explosions were observed until 7 August. The explosions lasted a few hours, stopped, then resumed a few hours later. The explosions were caused by the bursting of magma bubbles 2-3 m in diameter as they reached the surface. The noise from the explosions could be heard a few kilometers away. Shock waves were sometimes observed in the cloud above the pit. The maximum temperature of liquid lava inside the pit was estimated with the optical pyrometer at 964°C. Pyrometer measurements were taken standing on the S border of the crater rim under conditions of good visibility. Maximum temperature estimates on liquid lava varied between ~935°C and 965°C. In addition, the team measured rain acidity at different sites inside the caldera. A clear gradient was found: the rain had a pH of 2 on the Benbow crater rim and a pH of 4 close to the caldera's border. Information Contacts: P. Vetch and S. Haefeli, Société de Volcanologie Genève (SVG), C.P. 298, CH-1225, Chene-bourg, Switzerland. This long-active caldera was visited by John Seach during 4-7 September 1998. At Niri Mbwelesu Taten, a small collapse pit, strong degassing was observed as well as yellow sulfurous deposits on the NW wall. During the night, degassing was heard from a distance of 4 km and white vapor tinged with blue was constantly emitted from the pit. Niri Mbelesu crater was constantly full of vapor resulting in poor visibility. But bubbling lava was heard and at night the clouds reflected a red glow from the crater. At Mbwelesu crater, an active elongated lava lake (~100 x 30 m) was observed. The larger explosions threw lava high into the air and onto the crater wall. To the east of the lava lake a smaller elongated vent contained lava. On the NW wall of the crater was a circular vent 20 m in diameter from which no lava was extruded. Benbow crater was climbed from the S. The sound of bubbling lava was heard but not observed, and there was a very intense night glow. Information Contacts: John Seach, P.O. Box 16, Chatsworth Island, N.S.W. 2469, Australia. Ambrym Island was investigated by John Seach and Perry Judd during a climb into the caldera 1-8 January 1999. A lava lake in Benbow cone was present during 1-3 January but was covered by deposits from an avalanche that occurred overnight 4-5 January. Fumarolic and Strombolian activity was observed at other craters. Activity at Benbow. Benbow crater was climbed from the S, after which observers lowered themselves using ropes 200 m down from the crater rim to a point where they could observe the crater interior. In the center of the crater, an active lava lake was seen 220 m below the observation point. The lava lake was ~40 m in diameter and constantly in motion. Large explosions caused lava fountains that reached 100 m high. Bombs glowed for up to one minute in daylight and radiated great heat. Bombs could be heard landing on the side of the pit where they caused glowing avalanches. At night a strong glow from the lava lake was visible in the sky over Benbow. Elsewhere inside Benbow crater, Pele's hair covered the ground and fumaroles were active on the NE crater wall. Acid rain burned eyes and skin. Heavy rainfall caused many waterfalls to form inside the crater rim and a shallow brown pond formed on the floor of the first level. During 4-5 January violent Strombolian explosions could be heard almost hourly. Each series of explosions lasted 5-10 minutes and produced dark ash columns above the crater. At some time during these explosions an avalanche on the W side of the lava lake crater completely covered the lava lake. No night glow was visible above the crater after the night of 5 January. On 6 January Benbow crater was entered again. The wall collapse that covered the lava lake was confirmed visually. In the location of the former lava lake was a depression of rubble with two small, glowing vents nearby. The entire crater was clear of magmatic gases. Three violent Strombolian eruptions were viewed from the crater rim in the afternoon. Bombs were thrown 300 m into the air and dark ash clouds were emitted. Activity at Niri Mbwelesu Taten. This small collapse pit continuously emitted white, brown, and blue vapors. Red deposits covered the crater walls. A small amount of yellow deposits covered the S wall. Fumarole temperatures were 66 to 69°C at a point 40 m SE of the pit. On 6-7 January numerous deep, loud degassings were heard from a distance of 4 km. Activity at Niri Mbwelesu. Pungent, sulfurous-smelling white vapor was emitted from this crater. Periods of good visibility enabled views 200 m down from the crater rim, but the bottom could not be seen. Rockfalls were heard inside the crater. Activity at Mbwelesu. Excellent visibility to the bottom of this crater enabled detailed observations of the lava lake. Night observations were also obtained. The lava lake was in constant motion and splashing lava out over the sides of the pit. The lake was at a lower level than during observations made three months earlier (BGVN 23:09). Large explosions sent lava fountains up to 100 m in height and threw lava onto the sides of the pit causing glowing avalanches. During one night observation a 20 x 5 m section of the crater wall broke off and fell into the lava lake. The 60-m-wide lake radiated heat that could be felt from the viewing area 380 m away. North of the lava lake was a circular vent 20 m in diameter that glowed brilliantly from magma inside and huffed out burning gasses every 20 seconds. Foul gas, smelling of rotten fish, was emitted from the crater. South of the lava lake was an elongated vent (40 x 10 m) that spattered lava every 5-10 seconds and sent showers of glowing orange lava spray 150 m high. On the S side of Mbwelesu, fumarole temperatures averaged 43°C at 10 m from the crater edge. On the SE side, 40 m from the crater edge, fumaroles measured 57°C. On 4 January ashfall occurred on the S side of the caldera. Information Contacts: John Seach, P.O. Box 16, Chatsworth Island, NSW, 2469, Australia. Observations within Ambrym's summit crater were made by John Seach during a 22-30 August 1999 climb. There are two active cones in the caldera complex, Benbow and Marum. The Marum cone has three active sub-craters: Mbwelesu, the main crater; Niri Mbwelesu, a secondary crater close to Mbwelesu's rim; and Niri Mbwelesu Taten, a small collapse pit to the S of Niri Mbwelesu. Seach found increased activity compared to a previous visit in January 1999 (BGVN 24:02), with one new vent inside the Benbow crater and a second lava lake in Mbwelesu crater. Temperature measurements were made with a hand-held digital thermometer with an 8-cm probe. All depth estimates are visual; distances were estimated in comparison to a climbing rope. A Mw 6.5 earthquake on 22 August was centered ~18.6 km NW of Ambrym volcano. Seach reported that the earthquake was felt with an intensity of MM VI with large ground movements in a NW-SE direction for 10 seconds. The earthquake caused landslides in the caldera and opened large cracks in the rim of Benbow crater. Coconut trees were knocked down on the W coast of Ambrym Island, and there was infrastructure damage in southern Pentecost Island. Fourteen aftershocks were felt during the next 8 hours. Activity at Benbow. The crater was full of vapor when climbed on 22 August, but bubbling lava sounds were heard. A brown ash emission at 1740 was followed that night by moderate glow. Occasional crater explosions were heard between 1400 and 2100 on 26 August. Good visibility into the crater the next day showed that a new vent had opened on the N crater floor that was continually emitting light brown ash that rose 1,500 m above the crater floor (~2,300 m altitude) before being blown to the SE. Thicker ash emissions about every 5 minutes were accompanied by vigorous degassing; these emissions rose at a rate of ~13.5 m/s. From 1615 to 1625 on 27 August there were 66 discrete explosions or loud venting noises heard from the crater. At one location on the NW rim of the central crater, 200 m from the new vent, a recent ash deposit was ~50 m thick. Fumaroles were active on the inside N wall of the central crater, with yellow and red deposits at their bases. The lava lake vent that was covered by an avalanche in January had reopened and exhibited orange glow from the pit at night; white vapor tinged with blue was emitted, and brown ash was ejected every 15-30 minutes. Both active vents glowed a brilliant orange color at night. Loud degassing was heard at 0620 on 28 August from a distance of 4 km. Activity at Mbwelesu. Excellent visibility at times during 26-28 August allowed detailed observations of the crater bottom. Continuous load roaring and crashing sounds were heard coming from the pit. Explosions shook the ground and bombs could be heard striking inside the crater. An observer on the E edge of the crater, 350 m from the lava, felt radiant heat. Scattered blocks 20-30 cm in diameter and Pele's hair covered the edge of the crater. A fumarole field 60 m SE of the crater had a measured temperature of 53°C. A brown pond was present on the floor of the Marum crater. The central floor of the 1953 crater (in Marum adjacent to Mbwelesu) contained a green pond surrounded by active fumaroles. Intense night glow was visible on the evening of 26 August. Three vents were active within the Mbwelesu crater. Vent A, in the SE part of the crater, was ~10 m wide and ejected sprays of lava 150 m high every 5-10 seconds. Occasional lava spatter fell onto the vent wall. Lava spray was generally directed S, and formed black marks on the wall of Mbwelesu crater. Vent B, in the central part of the crater, was roughly circular and ~45 m in diameter. It was ~15 m from the rim to the lava lake. During this visit the lava lake exhibited 20-m-high waves moving across the pit. Vigorous boiling of the surface and incandescent lava fountaining to 150 m heights was observed. Some black bombs were ejected. At 1220 on 28 August a large part of the S rim of the pit fell into the lava lake, generating a large brown cloud that filled Mbwelesu crater and triggering Strombolian explosions for the next 10 minutes. Vent C within the Mbwelesu crater (figure 4) was located NW of Vent B. When seen in January 1999 this vent emitted burning gas, but it had deepened, widened, and contained a lava lake by 28 August. The elongate ~75 x 45 m pit had a steep N wall (~75 m high), but was open to the S (rim ~15 m above the lava lake). The lava lake surface was directly visible and boiling violently, ejecting showers of dark bombs every 1-2 seconds. Lava fountaining occurred from a fixed point along the edge from the NE to the E side of the pit. Some bombs remained incandescent for 20 seconds in the daylight. Lava was splashing onto the SW walls and sides of the pit after emerging from the NW edge of the lake. Horizontal current flow was estimated at 8 m/s towards the SE shore across at least 75% of the diameter of the lake. Three simultaneous 20-m-diameter lava bubbles were seen that almost filled the entire lake surface. Figure 4. 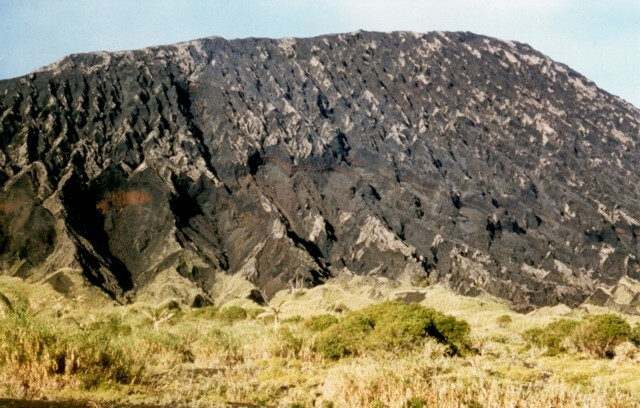 Photograph of Vent C in the Mbwelesu Crater at Ambrym, 28 August 1999. Courtesy of John Seach. Activity at Niri Mbwelesu. White sulfurous-smelling gas was emitted from the pit in late August. Mild degassing was observed from the south part of the crater, and fumaroles were active on the N crater wall. Activity at Niri Mbwelesu Taten. Compared to January 1999, in late August there was an increase in activity and substantial morphological changes. On 25 August at 1045 a thick brown ash emission continued for 5 minutes, rising 300 m and then being carried 4 km NW by the wind. Similar ash emissions occurred at 10-20 minute intervals during the afternoon. The E rim was littered with new rocks. Recent cowpat bombs were present 10-20 m from the E side of the crater. Mild degassing and sloshing lava sounds were heard. Fumaroles were active in two small collapse pits on the SE side of the crater. The fumarole field 40 m SE of the main pit had a temperature measured at 67-69°C, the same as in January 1999. Views into the crater to a depth of 150 m were obtained on 28 August, but the bottom was not seen. The south inside wall was covered with yellow deposits. Red-brown ash was building a raised rim on the NW side of the pit. The pit was degassing every 1-2 seconds. Fumaroles on a sill 50 m down were venting in unison with the main pit. Bubbles of hot gas 20 m in diameter were observed rising from the vent at 30 m/s. Figure 5. Lithic block ejected 100 m NE of the Niri Mbwelesu Taten collapse pit at Ambrym, August 1999. Courtesy of John Seach. Information Contacts: John Seach, P.O. Box 16, Chatsworth Island, NSW 2469, Australia. Eruptive activity continued at Ambrym in late 1999 and through January 2000. A volcanic ash advisory regarding this volcano was issued to aviators on 1 November 1999 reporting "smoke and ash" rising to ~1,500 m altitude. Similar notices were issued on 5 and 6 November. [Aviation reports on 9-10 December] described an ash cloud up to 2,700 m altitude. John Search and Geoff Mackley investigated Ambrym caldera during a 19-28 January 2000 climb. Lava lakes had disappeared from both Benbow and Mbwelesu craters and a new vent had opened inside the previously inactive 1953 crater. A series of earthquakes were registered around Ambrym Island on 27 November 1999. The largest of these was magnitude 7.1. The earthquakes were followed by a month of reduced activity during which there were no reported observations of lava lakes. Landslides were visible in the caldera and ground cracking visible at Benbow, Mbwelesu, and Niri Mbwelesu craters. Activity at Benbow Crater. Four vents were active inside Benbow. On 19 January a white plume tinged with blue and yellow rose 1,000 m above the crater rim. Twin plumes were visible the next day rising from the S end of the crater at 15 m/s and from the N end of the crater, where they were tinged with brown. Each time the crater was climbed from the S on 22, 23, and 24 January the pit was full of vapor and no sounds were heard. On 25 January the observers lowered themselves into Benbow using 200 m of rope. The floor of the first level was covered with fine brown ash and a shallow brown pond was present in the SW end of the crater. The inner crater was climbed and observations made from its rim. Below the observers was a ledge 120-140 m down covered with ash and containing a 10-m circular vent emitting white vapor. The main vent was 50 m farther down and 40 m in diameter. This was the vent that contained the lava lake in January 1999 (BGVN 24:02). No lava was observed inside this vent and it made no sound. At 1300 a large roar from the vent was followed by brown ash emission. At the NE end of the inner crater was a plume emission from an unseen vent. The N end of Benbow crater (on the first level) contained another vent that could not be directly observed but regularly emitted light brown ash. On 26 January a loud continuous 30-second degassing heard from the N vent was followed by brown ash emission and rain of small cinders on observers at the S crater edge. From the central pit the vapor was rising at 5 m/s. During the late afternoon two visible atmospheric perturbations were observed above the main vent. The first followed a loud degassing sound and rose at 40 m/s to a height of 200 m above the vent. Rockfalls were also heard during the afternoon. During the night of 26 January twin skyglows of fluctuating intensity were visible above Benbow followed by a large brown ash emission that rose 1,400 m above the crater in 3 minutes. Activity at Niri Mbwelesu Taten. On both 19 and 20 January light brown or red/brown ash was emitted from the collapse pit and rose 200-250 m. On 21 January a brown pond of water 150 m NE of the pit was bubbling from both fixed and random locations. Active fumaroles were present on a ledge 60 m down. There were large cracks on the SE side and evidence of wall collapse since August 1999. Ash fell on observers in the area N of the pit. On 23 January larger ash emissions occurred about every hour. On 24 January the collapse pit was entered using ropes. Fumaroles on the ledge 60 m down averaged 64°C. The pit bottom was 120-140 m below the ledge covered in brown ash. Small clouds of ash were emitted occasionally from two large fissures. Bubbles of hot blue vapors, 6 m in diameter, rose past the observer. Continual degassing sounds were heard in the pit, like the sound of waves crashing on the beach. On 26 January from 0600 to 1100 dark gray ash clouds were continually being emitted from the pit. Plumes rose at 8 m/s to a height of 200 m above the pit, filling the caldera in all directions. During the afternoon the pit returned to a low level of activity. On 27 January a continuous emission of brown ash occurred all day to a height of 800 m above the pit. Activity at Niri Mbwelesu. On 20 January white vapor tinged with blue was constantly emitted to 600 m above crater. During the evening a very intense pulsating night glow was visible. The glow would brighten (sometimes flicker), then rapidly drop to a lower level of illumination. The bright/dim cycle would repeat every 10-15 seconds. On 21 January in the afternoon degassing was heard from the crater rim and during the evening clouds were illuminated 250 m above the crater. Observers on the crater edge felt hot vapor. When the crater was climbed on the evening of 25 January a clearing of the vapor enabled the bottom to be seen 280 m down. A 40-m-diameter vent was visible emitting bright yellow burning gas, radiant heat was felt on the faces of observers, and moderate degassing was heard. Activity at Mbwelesu. Observations were made of Mbwelesu crater on 21 January. The two lava lakes observed in August 1999 had disappeared (BGVN 24:08). A brown pond surrounded by fumaroles was in the Vent B location, with large amounts of ash and rock to the SE. The sill on the SE edge of the crater had large craters and several large sections (over 10 m) that had broken off and fallen into the crater. The fumarole field 40 m SE of the crater rim had a temperature of 72.7°C. Heavy rains caused waterfalls and rockfalls inside the crater. The crater was otherwise quiet with some vapor emissions from many fumaroles on the floor. Fumaroles were also present in the location of the former lava lake at Vent C.
Activity in the 1953 Crater. The 1953 crater contained two levels. The higher (W half) contained a brown pond. The lower (E half) had developed a deep smoking vent. This was in the location of the green pond observed in August 1999. Information Contacts: John Seach, PO Box 16, Chatsworth Island, N.S.W. 2469, Australia; Wellington Volcanic Ash Advisory Center (VAAC), MetService, PO Box 722, Wellington, New Zealand (URL: http://www.metservice.co.nz/). Ambrym was observed during an aircraft overflight on 25 February 2000. Pilot reports indicated that lava was beginning to reappear in some vents. As previously reported (BGVN 25:02), the long-standing lava lakes in Benbow and Mbwelesu craters had disappeared after the 26 November 1999 earthquake. Activity increased slightly from January indicating the magma column may be rising again. Brown vapor was being emitted from Mbwelesu crater. The bottom of the crater could be seen but no lava was observed. Four craters, each ~8 m in diameter, were located on a 40 x 10 m section of the sill on the E rim of the crater. This rim had been weakened by the November 1999 earthquake and appeared ready to fall. Both vents inside Benbow crater emitted white vapor, which rose 1.5 km as one plume. The bottom of the vents could not be seen. Information Contacts: John Seach, PO Box 16, Chatsworth Island, N.S.W. 2469, Australia. The following report discusses observations of Marum and Benbow craters (in the central and WSW portions of Ambrym's caldera, respectively). The observations were made in September-October 1999 and August-October 2000. Our previous Ambrym report discussed aerial observations made in late February 2000 (BGVN 25:04). Marum and Benbow host long-standing lava lakes with active surfaces (sometimes molten and sometimes chilled). 1999 Marum observations. On 24 September 1999 the lava lake was once again present at more or less the normal site. It measured ~60 m in diameter and underwent significant degassing accompanied by turbulent waves and the escape of incandescent fragments. On several occasions, observers witnessed large collapses on the periphery as well as rapid and sudden variations in the lake's surface level. At the foot of the SE face, perhaps three explosive vents ejected plumes of ash and cauliflower-shaped discharges of steam at irregular intervals varying from 8 to 30 minutes. At night, observers distinguished incandescence along concentric faults on the lava lake. On 22 October 1999 observers camped on the crater's edge, on the ash-covered floor found to its ESE. They noted that the main lava lake had grown since September, and it displayed more violent, regular degassing. Its surface was continuously disrupted by waves and escaping incandescent fragments that rained all the way down the active terrace. Observers saw a second small elongate lake and reported that its surface too was sometimes very agitated. At night, several incandescent faults were seen on the bottom of the terrace. These spread open and then closed, indicating that the entire zone had a thin, partially solidified crust. On 23 October bad weather prevented visual observations, but at night observers saw intense red glow, felt tremors, and heard rumblings. On 24 October, at sunrise, the meteorological conditions were excellent, but volcanic gas obscured the crater. 1999 Benbow observations. On 23 September 1999, observers looking toward Benbow crater from the sea saw a large column of ash and gas rising about 1,200 m above the crater. On two occasions at night, visitors saw brief instances of weak incandescence in the plume's interior. A month later, on 23 October 1999, despite unstable weather conditions, observers reached summit crests and saw gas occupying the crater's interior. They saw the first terrace only for a brief moment and then only partially, making it impossible to say whether the lava lake was again molten at the surface. The characteristic rumblings that accompanied the regular degassing on the lake's surface were perceptible but weak, as if molten material lay beneath a thin chilled surface. 2000 Marum observations. During the nights of 2 and 3 August 2000 a lava lake was clearly visible (about 100 x 60 m in size). Regular and sustained degassing agitated the surface with big waves. Showers of incandescent fragments rose to heights of ~50-70 m.
On the night of 16 August a tropical depression crossed the region affecting an area extending at least as far as the Banks Islands ~200 km N. Heavy rains fell on the Marum plateau. Thick "smoke" rose from the crater, impeding visual observations. On the night of 30 September-1 October, incessant rain again fell on the Marum plateau. Very poor visibility in the crater stopped for a few minutes around 0100, enabling observers to confirm the absence of the lava lake's exposed molten surface. At that time, only two small and closely spaced circular vents emitted incandescent gases. 2000 Benbow observations. Observers descended to the first terrace level on 3 August 2000, crossing along the crests that encircled the central shaft. At this time, there was no exposed molten lava on the lake's surface. Still, violent and continuous explosions fed a darkly colored, dense ash plume. These outbursts came from a vent situated in the deepest part of the central opening. The excursion failed to get around the NE vent on the terrace level N1 due to a zone of mass wasting that left a scar ~160 m deep. On 17 August, torrential rains and excessively violent winds impeded attempts to approach Benbow. On 1 September, people descending to terrace N1 felt sub-continuous tremor but found comparatively little gas. What gas there was looked blue in color and hung over the central opening. The lava lake was once again present (but difficult to see due to impeded access caused by the above-mentioned scar). Degassing accompanied by rumblings and strong detonations sent incandescent lava fragments to heights of ~100 m.
Information Contacts: G. de St. Cyr, c/o Bulletin of the Geneva Society of Volcanology, C.P. 6423, CH-1211, Geneva 6, Switzerland. Observations of Ambrym were made by John Seach during a climb to the caldera during 11-15 December 2002. Lava lakes were visible in both Mbwelesu and Benbow craters that had been absent during a visit in February 2000 (BGVN 25:02) . Reports from local guides indicated that two lava lakes appeared in Mbwelesu crater during February 2001 and joined to form a single lava lake in August 2001. A lava lake reappeared in Benbow crater during June 2002. During November 2002 acid rain, for the third consecutive year, destroyed the mango crops between Sanesup and Lalinda on the W coast of Ambrym. Activity at Mbwelesu Crater, 12 December 2002. Perfect visibility into the crater enabled detailed observations of the lava lake over 5 hours from the S side of the crater at an elevation of 950 m and over 300 m above the lava lake. The lava lake, located at the bottom of Mbwelesu Crater inside a circular pit (figures 6 and 7), had a diameter of 40-50 m, was in constant motion, and made continuous loud crashing sounds like waves at the beach. The lava lake was much more active than during previous visits in 1998 and 1999. Pele's hair littered the observation area, and white lithic blocks up to 30 cm in diameter were scattered on the rim. Figure 6. 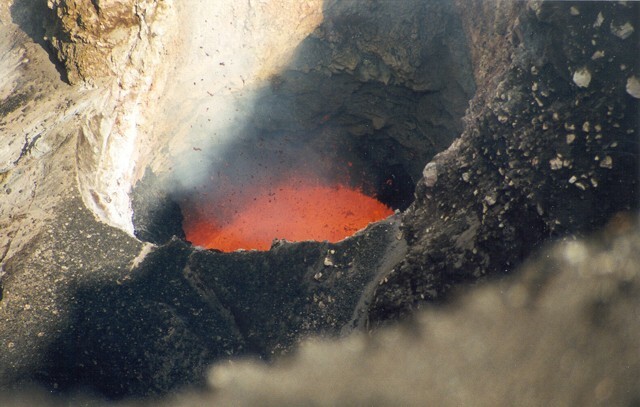 Photo of the lava lake inside a circular pit within Mbwelesu Crater at Ambrym, 12 December 2002. The diameter of the lava lake is 40-50 m. Courtesy of John Seach. Figure 7. Photo showing the violent degassing from the lava lake in Mbwelesu Crater at Ambrym, 12 December 2002. Courtesy of John Seach. The surface of the lava lake was continuously disrupted by degassing. Bubbles caused the lake surface to blister and finally burst, splashing lava into the air. Up to eight large bubbles formed at any one time and covered over 80% of the lake surface. The cycle of bubble formation and rupture took about 3 seconds. Waves up to 10 m high formed due to the degassing and crashed onto the side of the pit. After lava waves hit the side of the pit there was a drain-back of lava into the main lake much like ocean waves receding off a beach. Jets of lava were regularly expelled from the lake surface and directed both vertically and at an angle towards the pit side. Fountains reached up to 40 m high. Blobs of molten lava spattered onto the side of the pit up to 20 m from the lava lake edge. This spatter was more erratic than lava fountains and sprayed over a greater area. When large amounts of lava were thrown onto the pit wall, some would cascade back into the lake via a lava stream, lava fall, or a wide curtain of orange flowing lava. Crusting of the surface was observed when parts of the lake had a lower level of activity, most often in the NE part of the pit opposite the area of most vigorous degassing. Sometimes a lava fountain would burst through the crust, throwing darker pieces of lava high into the air. At times the orange lava lake surface was covered with black pieces of broken crust. Crusting lasted for only a few minutes at a time before it was disrupted by fountains or waves. Lava disappeared into the lava lake surface by subducting under layers of other lava. Some lava disappeared into overhangs on the side of the pit. Lava lake activity continued out of view for an unknown distance past these overhangs. The lava lake level rose and fell over a period of less than an hour in response to changes in the surface degassing rate. When the rate of degassing was high the lake level was raised by 10 m. The changes appeared to be caused by inflation of the lake due to gas rather than any change in lava eruption rate. During a period of low lava lake activity, the whole lake surface tilted 5 m towards the N and then back to the S over a two-second period. Violent intra-crater winds were observed around the lava lake as reflected in their effects on gas emissions. These were also felt beside the lava lake in Benbow crater. Vapors emitted from the lake surface were white tinged with blue. Two 15-m-diameter vents 100 m N of the lava lake and 60 m higher were separated by a thin wall. The W vent did not show any activity. The E vent made almost continuous loud degassing noises, and larger explosions ejected black ash 50 m into the air. 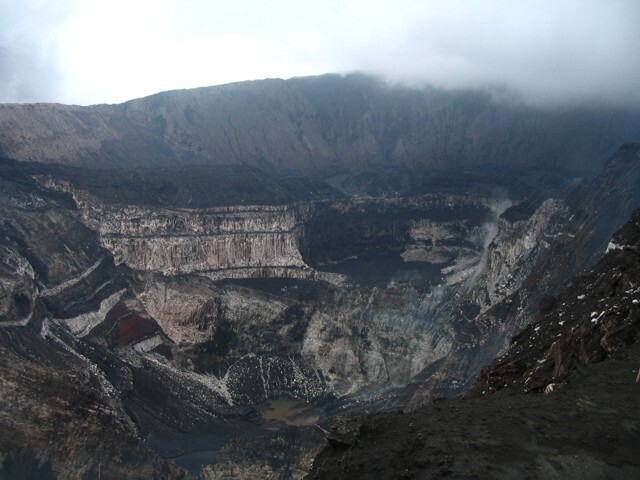 Mbwelesu was approached again on 15 December, but rain the previous day and low clouds had filled the crater with white vapor, allowing only brief views of the still constantly active lava lake. Activity at Mbogon Niri Mbwelesu, 12 December 2002. This small collapse pit has been re-named (formerly Niri Mbwelesu Taten) after a request by local residents. The new name comes from the local Port Vato language of W Ambrym, as did the previous name, but is more culturally appropriate. The translation of the new name is " mouth of the wild young pig" (Mbogon = mouth, Niri = son, Mbwelesu = wild pig). On 12 December excellent visibility enabled detailed observations into Mbogon Niri Mbwelesu. Observations were made from the N side of the pit. Loud crashing, degassing sounds were heard inside the pit, and a 10-m-diameter vent was observed on the floor about 180 m below. The pit glowed bright orange, but lava was not directly observed. This was the first time in 2002 that guides had observed the presence of lava in this pit. Loud degassing occurred every few seconds, and the larger explosions were accompanied by light brown emissions and ground shaking. Pungent sulfurous fumes were emitted from the pit, forcing the observer to use a respirator at times. Strong degassing of brown vapors was coming from the E side of the pit, 50 m below the rim. The W inside wall of the pit was coated with red and yellow deposits. Activity at Niri Mbwelesu Crater, 12 December 2002. On 12 December excellent views were obtained into Niri Mbwelesu. A recent large landslide on the W wall of the crater had covered the previously lava-filled vent. Rockfalls were heard regularly inside the crater and degassing occurred about every 30 seconds. About every 20 minutes larger explosions were heard at the crater; some were audible over 3 km away. Activity at Benbow Crater, 13 December 2002. Benbow was climbed from the S on 13 December. The observer free-climbed 165 m down to the floor of the first level, and then another 45 m further down to the edge of the lava lake pit in the N of the crater. Inside Benbow there were two active pits. The larger pit, in the middle of the crater, contained a crusted lava lake and two active vents. The SW vent was 25 m in diameter and was full of vapor but emitted no sounds. The NW vent was 10 m in diameter, glowed red, and loudly degassed. The N crater in Benbow contained an active lava lake. The observer climbed to the rim and was able to view the lake surface, ~50 m below, for a few seconds before retreating. The lava lake was in constant motion and lava was ejected in to the air. Violent winds (over 80 km/hour) were generated inside the pit and made observations on the edge dangerous. At times the pit was filled with white and blue-tinged vapors which made breathing difficult. The lava lake made continuous rumbling and sloshing noises. On a wall next to the lava lake pit there was dripping water with a pH of 3.5 and 700 ppm total dissolved solids. Visit to Ambrym, 15-20 August 2001. Jeff and Raine Williams, sailing aboard the S/Y Gryphon, visited Ambrym Island during 15-20 August 2001. One day was spent hiking to the Mbwelesu crater with a guide from the village of Ranvetlam. Their report has been reduced here to basic observations; a more poetic and complete description of their hike can be found on their website. After leaving Ranvetlam, they began a steep climb through jungle and gardens, continuing through coconut groves and thick woods of breadfruit trees and wild nut trees. After an hour they were still passing through the garden plots of villagers. At higher altitudes the vegetation changed to bananas, kava, and lap-lap plants; wild tree ferns and palm trees were abundant. After about 90 minutes they emerged from the jungle onto a lava flow at the lower limit of the high central 'ash plain' plateau. They climbed along this "50-yard wide, black gravel road," also described as a "wild orchid-lined highway," through the jungle to the ash plain itself, where the tops of Marum and Benbow could be seen shrouded in clouds and mist. The hike continued across ~1.5 km of the ash plain before passing along a lava gully onto the final ridge, a 1-m-wide path of loose cinders and stone. They climbed to the rim and looked down the sheer, nearly vertical cliffs into the crater, where they heard rumbling and splashing sounds of the active lava lake. Although the weather was cold and windy, the fog cleared enough for the visitors to briefly observe bright red lava in the crater three times within 30 minutes. The 11-km-long hike to the crater took four hours, and another 3 hours to return. Information Contacts: John Seach, PO Box 16, Chatsworth Island, NSW, 2469, Australia (URL: http://www.volcanolive.com/); Jeff and Raine Williams, P.O. Box 729, Funkstown, MD 21734, USA. Although the current period of activity at Ambrym has been ongoing since June 1996, direct observations have been intermittent. Most recently, there have been reports of visits during January and February 2000 (BGVN 25:02 and 25:04), August-October 2000 (BGVN 26:02), and August 2001 and December 2002 (BGVN 27:12). Another report of scientific investigations from July 2000 is presented below. These observations are supplemented by MODIS data that indicate continued lava lake activity through much of 2001 and 2002. Observations during July 2000. During 8-11 July 2000, David Nakedau and Douglas Charley reached Ambrym and camped in the caldera, after the necessary authorizations from local chiefs. On 11 July, French and Italian scientists joined the group. During the following days two stations were installed, one close to the village of Lalinda, the other on the E flank of Benbow cone. The first station, composed of a broadband STS2 seismometer, was installed on a basaltic lava flow with the aim of recording local volcano-related seismicity and tectonic earthquakes. The summit station was equipped with a short-period Mark seismometer to record the activity of the lava lake that used to be visible at Benbow until 1999 and now has drained back at a greater depth due to the Ms 7.1 earthquake of 26 November 1999. The first results from the analysis of these data are currently in press (Carniel and others, 2003). On 11 July 2000 a visit was made to the Niri Taten Mbwelesu crater, where only fumarolic activity could be observed. The crater name means "the son of the female pig," given after its birth in 1989 near the existing Mbwelesu (the pig) and Niri Mbwelesu (the female pig). At the request of local residents, this crater was renamed Mbogon Niri Mbwelesu in December 2002 (BGVN 27:12). After more than a day of continuous rain, on 13 July the installation of the station on the Benbow rim was accomplished. During 13 July strong degassing noises were heard only sporadically from the Southern crater, which was otherwise showing low degassing rates and low-level noises. The southern crater has been observed since the first visits of Douglas Charley, and was the site where the lava lake was observed until 1999. The Northern crater, on the contrary, was not observed by Charley before 1997. Another small vent used to be present on its W side, but was completely buried by 1999 collapses. During 13 July, from the rim observations, this crater appeared to be the source of the strongest noises. During the following days, two descents were made into Benbow using ropes, one on 14 July by Carniel and Fulle with local guides Jimmy and Isaac; the other was made on 16 July by Charley, Garaebiti, Wallez, and Jimmy. The Southern, older crater, was obstructed and conical in shape. From it's central part, significant blueish-colored degassing was observed, indicating sulfur dioxide. On 14 July visible degassing activity was not accompanied by noticeable sound. On 16 July some small explosions were observed at this vent, which ejected centimeter-sized fragments. On the N side, a fault full of sulfur deposits was visible. Numerous concentric faults were also visible around the vent on the n, E, and W sides. A significant zone of fumarolic activity was concentrated on the N flank of the vent, mainly composed of water vapor. Other small fumaroles were located around the vent. A number of pits were aligned in the W and S border, with the most significant fumarolic activity at the S side, where blueish sulfurous gas escaped continuously. The Northern crater emitted significant water vapor plumes. To the N and to the S of the vent, two deep tracks were created by water runoff during strong rainfalls. To the E, the border of the vent was formed by rock debris, which, according to the guide Jimmy, was emplaced as a consequence of the strong 26 November 1999 earthquake. Both on 14 July and on 16 July the sound from the N crater appeared to be much lower than from the S crater, an observation opposite to the one made from the Benbow rim on 13 July. On 14 July scientists observed several more dense water vapor clouds, some of them accompanied by the fall of very small (less than 1 cm) light lithic fragments. Marum, and the surrounding vents of Mbwelesu, Niri Mbwelesu, and Niri Taten Mbwelesu, were visited again on 16 July. Mbwelesu was intensely degassing, which often precluded direct observation of the crater. On the SE side, where a lava lake used to be, only a static mud pond could be seen. Also Taten Mbwelesu crater was showing intense degassing accompanied by strong noise, which made observation difficult. Niri Taten Mbwelesu showed intense degassing but no noise. The dropping of rocks into the pit confirmed the presence of a mud pond at the bottom, at an approximate depth of 200 m.
On 17 July the scientists left the volcano for the village of Lalinda, where they met with the custom chief and the population in order to inform them about the activity of the volcano and about the research. On the early morning of 19 July the two eruptive plumes from Ambrym's main cones were clearly visible at a distance from the island of Paama. However, only the plume produced by Marum was colored pink-orange; this observation suggests the presence of lava at shallow depth in one of its vents, although such a feature was not observed directly during the previous days. MODVOLC Thermal Alerts, 2001-2002. MODIS detected quasi-continuous thermal alerts for Ambrym throughout 2001 and 2002 (figure 8). Moreover, these occur fairly equally in two clusters interpreted as representing Benbow and Marum (figure 9). These data provide strong evidence in favor of continued lava lake activity. The highest alert ratios for the period of -0.107 on 9 April 2001 in Marum and -0.116 on 3 November 2001 in Benbow may represent episodes of overturn. Marum appears to have been particularly active also during January-February 2002 when the anomaly usually consisted of either 4 or 6 alert-pixels (figure 9). Anomalies continued in January-February 2003. Figure 8. MODIS thermal alerts on Ambrym during 2001-2002. Courtesy of Diego Coppola and David Rothery, The Open University. Figure 9. Locations of alert-pixels on Ambrym during 2001-2002. The intracaldera craters are Benbow (B) and Marum (M). The base map is not independently geolocated, so the alert-pixel overlay has been migrated to place the two clusters over the likely active craters. Base map is from SEAN 14:04, modified from geological (New Hebrides Geological Survey, 1976) and pedomorphological (Quantin, 1978) maps. Courtesy of Diego Coppola and David Rothery, The Open University. References. Quantin, P., 1978, Archipel des Nouvelles-Hébrides: Atlas des Sols et de quelques Données du Milieu: Cartes Pédologiques, des Formes du Relief, Géologiques et de la Végétation; ORSTOM (18 sheets). Carniel, R., Di Cecca, M., Rouland, D., accepted Feb 2003, Ambrym, Vanuatu (July-August 2000): Spectral and dynamical transitions on the hours-to-days timescale: JVGR. Information Contacts: Diego Coppola and David A. Rothery, Department of Earth Sciences, The Open University, Milton Keynes, MK7 6AA, United Kingdom; Roberto Carniel, Università di Udine, Italy (URL: http://www.swisseduc.ch/stromboli/); Douglas Charley, Sandrine Wallez, and David Nakedau, Département de la Géologie, des Mines et des Ressources en eau, Vanuatu; Marco Fulle, Osservatorio Astronomico, Trieste, Italy (URL: http://www.swisseduc.ch/stromboli/); Esline Garaebiti, Université de Clermont-Ferrand, France; Daniel Rouland, E.O.S.T., Strasbourg, France; Geneviève Roult, I.P.G., Paris, France. John Seach previously reported his observations of the Ambrym caldera made during a visit in December 2002 (BGVN 27:12). This report contains his observations of the caldera during a 7-11 September 2003 visit and flyovers on 6 and 13 September. The level of activity during September 2003, with visible lava in six vents, was higher than that during his previous visit. Observations of Benbow. During the 6 September flyover, two white plumes were rising 200 m above the crater rim and drifting NW. On the evening of 7 September, orange glows were seen from the caldera edge (3 km SE). A strong glow originated N of the crater and the central crater pit produced a less intense fluctuating glow. During the 13 September flyover, both pits continued to emit white and light-brown plumes to 200 m above the rim. Observations of Mbogon Niri Mbwelesu. Large white vapor emissions from the collapse pit formed mushroom-shaped clouds on 6 September that drifted W and attained a height of 300 m. A visit to the S rim on 7 September showed a weak orange glow and copious gas emissions. On 8 September, observations from the N rim showed the pit full of swirling brown and white vapor. The NW wall was stained with yellow and red deposits, and pungent sulfurous gases were being emitted. Loud, rhythmic degassing sounds were heard every few seconds. The bottom of the pit was visible on 10 September, allowing views of two glowing red holes 150 m below the rim separated by a small wall a few meters wide. The two vents degassed simultaneously, but the E vent emitted larger amounts of brown ash. Observations of Niri Mbwelesu. During the 6 September overflight, the pit of Niri Mbwelesu crater was filled with white vapor. The crater was climbed on 8 September and observations from the S rim showed the crater still filled with vapor; no sounds were heard. During that evening, an orange glow was observed. Excellent visibility on 10 September enabled sighting of a 10-m-diameter, crusted lava pond. Red lava was visible through surface cracks, and lava spatter rose 10 m above them at infrequent intervals. Loud cannon-like explosions about every 20 minutes shook the ground and were accompanied by the sounds of cracking rock. During the evening, glowing projectiles were ejected into the air, although none fell outside the crater. Loud, roaring degassing noises like a jet engine at take-off were also heard. The roar would gain intensity over 30 seconds, cease for 15 seconds and then re-start. During periods of intense roaring, red lava was observed through cracks in the crusted surface. Both types of intense degassing were accompanied by gentle emissions of brown vapor. A pit, 6 m in diameter, located N of the crusted pond in the crater wall, emitted brown ash. Fumaroles were high on the N inner crater wall. Brown ash was emitted from the S crater floor. Observations of Mbwelesu. Mbwelesu crater was observed for 3 hours during mid-day on 8 September from a position on the SW rim. At times, the crater was filled with vapor, but observation of the lake surface was only possible about 60% of the time. The lava lake showed remarkable similarities in location, size, and dynamics compared to December 2002. The 50-m-diameter lava lake was contained inside a circular funnel-shaped pit 100-120 m in diameter. Violent agitation of the surface occurred most of the time. Lava splashed onto the pit walls and drained back vertically 25 m into the pit. Large 10-m-diameter gas bubbles burst in the SE half of the lava lake with up to eight bubbles visible at the same time. Jets of lava were ejected every few seconds, created by wave intersections from the bursting bubbles. During periods of low activity, lasting tens of seconds, lava drained back into the middle of the pit. Surface crusting occurred after as little as one minute during quiet periods. Subsequently, the crust was broken up by a resumption of degassing from the SW side of the pit. On several occasions, up to 80% of the lava lake surface was covered by darker crust. Acid rain was experienced on the edge of the crater and observers felt minor burning on the face. White, light-brown, and blue-tinged vapors smelling of sulfur were emitted from the crater. Mbwelesu was scaled again on 10 September and observations of the lava lake (figure 10) were made over eight hours. The crater was clear, enabling detailed observations. At times 80% of the lake surface was deformed by bubbling. The SE portion of the pit contained the most degassing. Violent explosions regularly sprayed orange lava mixed with black crust in all directions. At one point the whole lake surface rotated clockwise and lava drained back into the middle of the pit. This whirlpool was followed by an avalanche on the W side of the pit that threw black material into the lake. A second pit with a diameter of 75 m NE of the lava lake was separated by an unstable 10-m-wide wall from which numerous avalanches occurred during the day; red lava spatter was ejected once. Figure 10. Lava lake inside Mbwelesu crater at Ambrym on 10 September 2003. Surface crusting and degassing are clear, note new crater at top of photo. Courtesy of John Seach. An afternoon flyover on 13 September enabled excellent views of the active lava lake. The smaller pit NE of the lava lake contained a small lava pond with a diameter of ~ 8-10 m.
Observations of Marum. Two areas of fumarolic activity were seen at the edge of the 1953 crater (between Marum and Mbwelesu). Brown ash was being emitted from the ground at these locations. Information Contacts: John Seach, PO Box 4025, Port Vila, Vanuatu (URL: http://www.volcanolive.com/). Ambrym was last reported in BGVN 28:09, when details of activity observed during September 2003 visits were published. A daily summary of MODIS thermal alerts for the year ending February 2004 (table 1) suggests, subject to the limitations of thermal imaging (e.g. in times of heavy cloud), regular activity over the course of the year. No corroborative reports of activity have been received from the [Départment de la Géologie, des Mines et des Ressources,] or the Darwin Volcanic Ash Advisory Centre. Table 1. Nights on which MODIS thermal alerts were recorded for Ambrym, for the year ending February 2004 . Thermal alerts recorded in daylight hours have been omitted for data reliability reasons (four cases). Data courtesy HIGP MODIS Thermal Alert System. Information Contacts: HIGP MODIS Thermal Alert System, Hawaii Institute of Geophysics and Planetology, School of Ocean and Earth Science and Technology, University of Hawaii at Manoa (URL: http://modis.higp.hawaii.edu/). Ambrym (last reported in BGVN 29:03) exhibited high levels of activity in March and April 2004. During March, an active lava lake was present in Mbwelesu crater, one of the active summit craters. As of 27 March, there were reports that the people of Craig Cove in West Ambrym were suffering from the effects of the ongoing volcanic eruption on the island. Gas and acidic rainfall from the active vents on the volcano were threatening to destroy the local food gardens. The island was still recovering from the effects of Cyclone Ivy, which caused widespread damage two weeks earlier; the added affects of the eruption prompted Vanuatu's leaders to request emergency relief assistance from national and local authorities. As of 3 April, reports confirmed by the Darwin VAAC and J. Seach described continuing lava lake activity at Ambrym. On 27 April, a large ash plume was recorded drifting 150 km NW of the volcano, passing the northern tip of Malekula Island and almost reaching Malo Island. Eruptions were still continuing up to 2 May. NASA's Earth Observatory posted two images of Ambrym and its plume as they appeared on 27 April 2004 (figure 11). The pair of images came from the Moderate Resolution Imaging Spectroradiometer (MODIS) on the Terra satellite. 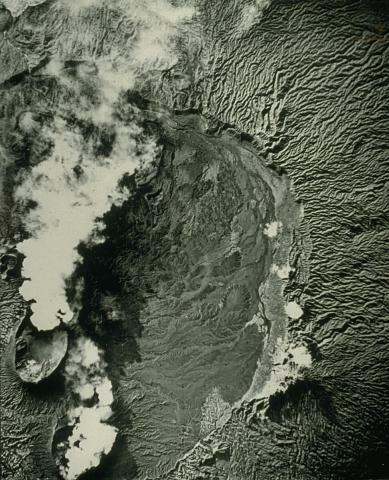 A large plume of volcanic ash blew westward from the volcano, which appears at the center right edge of figure 11 (top). The plume was mixing with clouds, and was more apparent as a bright, reddish orange color in the false-color image (below). Figure 11 (bottom) shows a wider area at the same spatial resolution. Figure 11. Ambrym volcano in two MODIS images (top and bottom). See text for discussion. Image courtesy Jeff Schmaltz, MODIS Rapid Response Team, NASA-GSFC. Information Contacts: John Seach, PO Box 4025, Port Vila, Vanuatu (URL: http://www.volcanolive.com/); Darwin VAAC (URL: http://www.bom.gov.au/info/vaac/); Jeff Schmaltz, MODIS Rapid Response Team, NASA-GSFC; Holli Riebeek, NASA Earth Observatory (URL: https://earthobservatory.nasa.gov/). 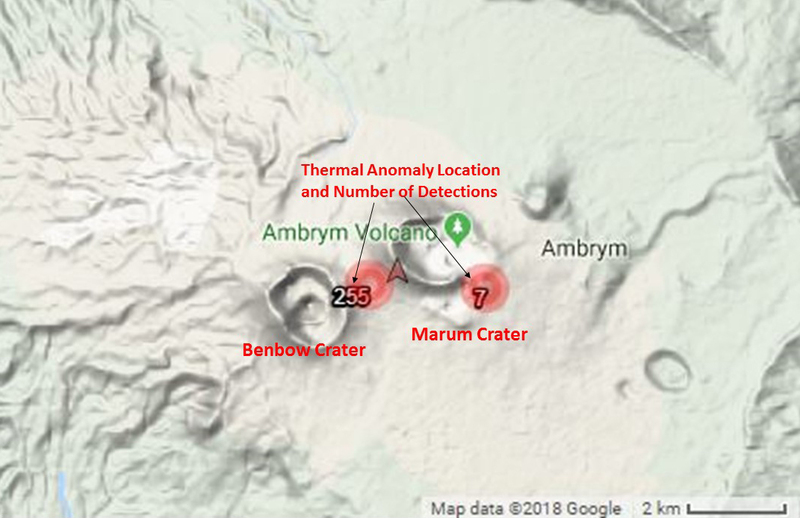 Ambrym triggered continued alerts during 2003 and 2004 at both Marum and Benbow craters, with Marum alerts being the slightly more common (figures 12 and 13). Activity appeared less intense than in previous years, but more alerts were issued due to the availability of Aqua data starting from January 2004. The highest alert ratio (-0.088) (see BGVN 28:01 for a discussion of the alert ration) was detected by Aqua on 14 May 2004 and the highest number of alert pixels detected for any one pass was four, a situation repeated on 29 June, 21 August, and 2 November 2003. Visual observations during September 2003 (BGVN 28:09) confirmed that there was activity at these craters. Figure 12. MODVOLC thermal alerts from Benbow crater at Ambrym, 1 January 2001-31 May 2004. Thermal alerts collated by Charlotte Saunders and David Rothery; data courtesy of the Hawaii Institute of Geophysics and Planetology's MODIS thermal alert team. Figure 13. MODVOLC thermal alerts from Marum crater at Ambrym, 1 January 2001-31 May 2004. Thermal alerts collated by Charlotte Saunders and David Rothery; data courtesy of the Hawaii Institute of Geophysics and Planetology's MODIS thermal alert team. Data acquisition and analysis. Reports from Diego Coppola and David A. Rothery provided analyses of MODIS thermal alerts during 2001 and 2002 (using the MODVOLC alert-detection algorithm) extracted from the MODIS Thermal Alerts website (http://modis.hgip.hawaii.edu/) maintained by the University of Hawaii HIGP MODIS Thermal Alerts team (BGVN 28:01). Rothery and Charlotte Saunders provided updates to 31 May 2004. MODVOLC data are now routinely available from the Aqua satellite (equator crossing times 0230 and 1430 local time) in addition to the original Terra satellite (equator crossing times 1030 and 2230 local time). Information Contacts: David A. Rothery and Charlotte Saunders, Department of Earth Sciences, The Open University, Milton Keynes, MK7 6AA, United Kingdom. Jenifer Piatt, a meteorologist with the Air Force Weather Agency in the Satellite Applications Branch, notified Bulletin staff on 17 June 2005 that haze had appeared near Ambrym on MODIS imagery over the past few days. Over the past several months, this volcano had been emitting SO2 and sometimes light ash. She informed us of several recent news articles that addressed this event and provided several satellite images (figure 14). Figure 14. Images for 0250 UTC 15 June 2005 (top), and 0240 UTC 17 June 2005 (bottom) disclosing the area around Vanuatu including Ambryn. The images came from NASA's AQUA MODIS satellite with a resolution of 500 m. SO2 plumes from Ambrym are labeled. NASA image courtesy of USAF Weather Agency. Tony Ligo wrote on 1 June 2005 in the Port Villa Presse that acid rain continued to fall in W Ambrym Island in Vanuatu, even after ash from the volcano had stopped falling. This prompted the provincial secretary general to discuss the need for new water sources. The Vanuatu government, through the department of Rural Water Supply, agreed to provide a drilling rig to the Malampa provincial government to drill on W Ambrym as soon as possible. The government also recognized the value of scientific and technical data; in order to effectively respond to such environmental problems the government needs to get more young people studying in this area. The article noted that Vanuatu only has one volcanologist, Charley Douglas, with enough background to give accurate data on current activity. Aid and food have been sent to affected areas on the western coast of the island, and a contingency evacuation plan is required for resettling people should this be necessary in the future. Health issues have been raised regarding hygiene, respiratory problems, asthma, and malnutrition over the past couple of months. Of great concern are health problems particular to children, including exposure to excess fluoride and the consequent risk of bone disease. The National Aeronautics and Space Administration (NASA) Earth Observatory web site reported that Ambrym volcano was the strongest point source of SO2 on the planet for the first months of 2005; it had been steadily emitting SO2 for at least 6 months, and satellite images produced using data collected by the Ozone Monitoring Instrument (OMI) on NASA's Aura satellite during the first 10 days of March 2005 show high concentrations of SO2 drifting NW. 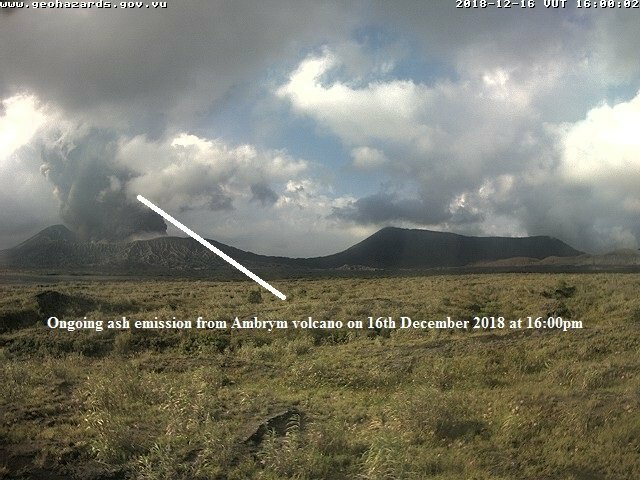 The web site article noted that "Ambrym is not erupting in the traditional sense with thick ash plumes and explosive bursts of lava, rather it is leaking SO2 gas from active lava lakes in what scientists call 'passive' or 'non-eruptive' emissions. Despite these gentle names, the volcano still threatens the local population. SO2 has a strong smell and can irritate the eyes and nose and make breathing difficult. Higher in the atmosphere, SO2 combines with water to create rain laced with sulfuric acid. On Ambrym, acid rain has destroyed staple crops and contaminated the water supply, leaving communities in need of food aid." In the past, satellites have been able to monitor SO2 emissions only from large eruptions or the most powerful passive degassing. All other SO2 emissions remain at low altitudes and have low SO2 concentrations that were hard to see from space. On 15 July 2004, NASA launched its Aura satellite carrying the OMI, which is part of a collaboration between the Netherlands' Agency for Aerospace Programs, the Finnish Meteorological Institute, and NASA. 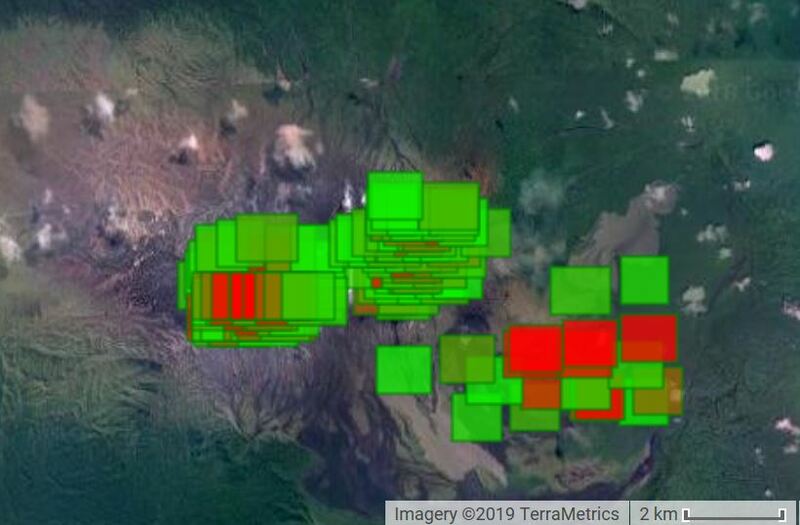 With greater spatial resolution (the ability to "zoom-in" to see greater detail) and higher sensitivity to SO2 than any previous space-borne sensor, OMI allows scientists to study passive volcanic degassing on a daily basis for the first time. The image in figure 15 is an example of the instrument's preliminary, uncalibrated, and unvalidated data. This new view of passive volcanic emissions could lead to significant advances in understanding both volcanic eruptions and the impact of SO2 on climate. Changes in passive emissions can be a precursor to explosive eruptions, and thus provide a warning signal that activity may be changing. Figure 15. A zone of elevated atmospheric SO2 from Ambrym during the interval 1-10 March 2005. The units on the scale bar reflect SO2 in terms of Dobson Units (DU). (A Dobson Unit represents the physical thickness of the SO2 gas if a 1 cm2 column of the atmosphere were brought to 0EC and 1 atmosphere pressure. A value of 300 Dobson Units equals three millimeters.) To process the OMI spectrometer data, two different pairs of measured UV wavelengths are averaged. The mean of pairs 1 and 2 is written as "P1-P2 mean" on the scale bar. Courtesy of Simon Carn. Information Contacts: Jenifer E. Piatt, HQ Air Force Weather Agency Satellite Applications Branch; Simon Carn, TOMS Volcanic Emissions Group, University of Maryland, 1000 Hilltop Circle, Baltimore, MD 21250, USA (URL: https://so2.gsfc.nasa.gov/); NASA Earth Observatory Natural Hazards web page (URL: http://earthobservatory.nasa.gov/NaturalHazards/). Thermal anomalies detected by the MODIS satellite instrument showed that the lava lakes present in Benbow and Marum craters, which have been almost continuously active since early 2001 (BGVN 29:06), continued until 19 June 2005. Ash had apparently stopped falling on 1 June, though a haze of SO2 was noted on 17 June (BGVN 30:05). Thermal anomalies were not regularly seen again until 11 January 2007. The only exceptions occurred from Benbow on 14 April 2006 (one pixel) and from Marum on 8 and 15 November 2006 (one and two pixels, respectively). Thermal anomalies were seen on 11 and 15 January, again during 3-19 February, and then almost daily after 9 March through at least the end of May. The current lava-lake activity, as determined by MODIS data, seems to be confined to the Marum crater area. The Wellington Volcanic Ash Advisory Center (VAAC) reported that on 3 April 2007 pilots observed lava and ash emissions from Ambrym; ash plumes rose to altitudes below 2.4 km. On 1 May at 1330 satellite imagery showed an ash cloud with NE winds at the surface turning to NW above an altitude of 3 km. On next day at 0715 a pilot observed a vertical plume extending 37 km NW at an altitude of 4 km. On 3 May at 0900 a pilot identified an ash cloud below an atmospheric temperature inversion at an altitude of -1.8 km drifting SE. Ash was visible on satellite imagery at 1310 on 3 May. Steven Clegg and Kelby Hicks reported that the volcano continued to exhibit strong degassing from both Marum (figure 16) and Benbow vents from 26 May to 12 June 2007. Within the Mbwelesu crater a lava lake appeared in May 2007, while the group was there, and continued to be visible through 12 June (figure 17). Fumarolic activity was visible throughout the interior of Mbwelesu Crater with intermittent ash eruptions and light tephra emissions. Extra-crater tephra fall included Pele's Hair, reticulite, spatter, and scoria-sized ejecta. Both Niri Mbwelesu and Mbogon Niri Mbwelesu (formerly Niri Mbwelesu Taten) craters exhibited notable fumarolic degassing, but no other observable activity. No lava lake could be seen from the rim of Benbow crater; however, a strong glow above Benbow was visible during night observations. Figure 16. View of the Marum cone at Ambrym looking SW, 7 June 2007. Incandescence from the active lava lakes can be seen reflected in the clouds (left). Courtesy of Steven Clegg. Figure 17. Lava lake inside Mbwelesu crater within Marum cone at Ambrym, 7 June 2007. Courtesy of Steven Clegg. Information Contacts: Steven G. Clegg and Kelby E. Hicks, Volcan, Inc., P.O. Box 1287, Austin, TX 78767, USA (URL: http://www.volcan.org/); Wellington Volcanic Ash Advisory Centre (VAAC), Meteorological Service of New Zealand Ltd (MetService), PO Box 722, Wellington, New Zealand (URL: http://www.metservice.com/vaac/, http://vaac.metservice.com/); Hawai'i Institute of Geophysics and Planetology (HIGP) Thermal Alerts System, School of Ocean and Earth Science and Technology (SOEST), Univ. of Hawai'i, 2525 Correa Road, Honolulu, HI 96822, USA (URL: http://modis.higp.hawaii.edu/). Thermal anomalies detected by MODIS instruments and processed by MODVOLC indicated that lava lakes in both summit craters at Ambrym have been at least intermittently active during November 2006 through February 2009 (figure 18). After MODVOLC alerts were detected on 8 and 15 November 2006 (BGVN32:05), they were again frequently identified from 12 January until 11 July 2007. Another cluster occurred between 31 October and 27 December 2007. A single alert occurred on 23 May 2008. Alerts resumed again on 21 October 2008 and continued through 15 February 2009. Figure 18. Maximum number of daily thermal alert pixels at Ambrym as identified by the MODVOLC system, March 2000-February 2009. Mapping of the pixels revealed thermal activity at both summit craters. Data comes from MODIS instruments on both Aqua and Terra satellites; the total shown is the maximum pixels per satellite per pass on a given day (UTC). Courtesy of Hawai'i Institute of Geophysics and Planetology (HIGP) Thermal Alerts System. 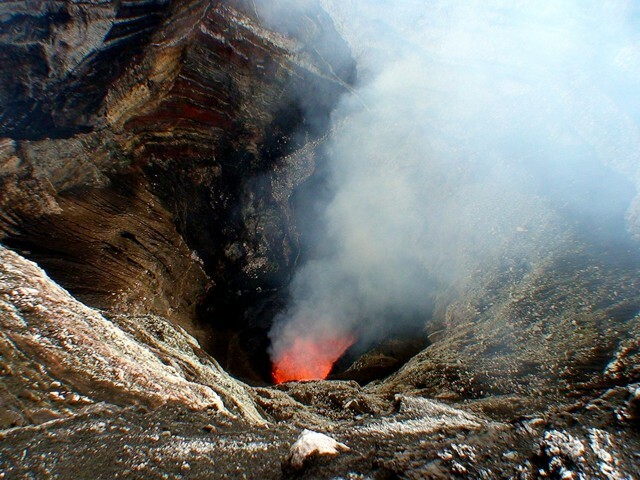 Observations during 31 August-8 September 2008.Arnold Binas reached the summit and observed lava lake activity during 31 August-8 September 2008, an interval without thermal alerts. Binas also reported that the lake was largely crusted over, abundant steam was emitted, and poor weather conditions often prevented views into the craters. Such factors may have prevented satellite detection of low-level activity during those, and possibly other, times. Binas climbed to the Benbow crater rim once, but thick steam prevented visual observation of the inner cone; however, strong degassing was noted, often in pulses. At Marum, low rain clouds on the SE side limited observations to periods of a few seconds at a time. During the visit, partial views into the Mbwelesu crater were rare through small gaps in constant rain clouds and strong steam emissions. A small lava lake was visible in the main vent, and another nearby opening often spattered small chunks of lava (figure 19). It appeared that both openings were holes through a crusted-over lava lake. The width of the visible portion of the larger opening, measured in digital image pixels at a given focal length and an assumed distance of 350-400 m, was determined to be on the order of 7.5-8.5 m. Waves rolled back and forth along the surface of the covered lake almost constantly, splashing lava through the holes, to a maximum height of about 30-35 m. Degassing also caused small explosions. Noises from the lava lake could be heard throughout the night from within the tent ~ 15 m from the crater rim, despite strong winds and rain. Figure 19. View into the Mbwelesu crater on the Marum cone at Ambrym, captured 7 September 2008. Lava can be seen through two gaps in the crusted-over lava lake (enlarged insets). Courtesy of Arnold Binas. Strong gas emissions took place in Niri Mbwelesu, with only very rare views of the crater floor, on which a small lake of brownish water was present next to a steaming vent. Mbogon Niri Mbwelesu displayed mostly strong but silent gas emissions from fumaroles on the crater floor, occasionally clearing enough to enable views of the bottom. Sometimes small rockfalls were heard, but not seen, inside the crater. Information Contacts: Hawai'i Institute of Geophysics and Planetology (HIGP) Thermal Alerts System, School of Ocean and Earth Science and Technology (SOEST), Univ. of Hawai'i, 2525 Correa Road, Honolulu, HI 96822, USA (URL: http://modis.higp.hawaii.edu/); Arnold Binas, Toronto, Canada (URL: http://www.summitpost.org/user_page.php?user_id=42443, http://www.flickr.com/photos/hshdude/collections/72157600584144439/). Lava lake activity in both summit craters at Ambrym has been documented by the frequent presence of thermal anomalies, detected by MODIS instruments and processed by MODVOLC, between 21 October 2008 and 24 September 2009 (figure 20). Prior to this eruptive episode, the active lava lakes caused detectible thermal anomalies in November 2006 (BGVN 32:05), January-July 2007 (BGVN 34:01), and October-December 2007 (BGVN 34:01). Figure 20. Maximum number of daily thermal alert pixels at Ambrym as identified by the MODVOLC system, 2005-2009. Mapping of the pixels revealed thermal activity at both summit craters. Data comes from MODIS instruments on both Aqua and Terra satellites; the total shown is the maximum pixels per satellite per pass on a given day (UTC). Courtesy of Hawai'i Institute of Geophysics and Planetology (HIGP) Thermal Alerts System. Ash plumes reported on 25-26 March 2009 resulted in advisories to aviators issued by the Wellington Volcanic Ash Advisory Centre (VAAC). The airport control tower in Port Vila, Vanuatu, informed the VAAC on 25 March of an ash plume that rose to an altitude of 2.1 km and drifted about 55 km S. A pilot report the next day noted "smoke" rising to 2.4 km altitude. Although ash was not visible on satellite imagery analyzed by the VAAC on those days, thermal anomalies were seen in MODIS data on 25 March. Additional plumes described by the NASA Earth Observatory were seen in visible MODIS imagery on 6 October and 3 December 2009. On both days the light-colored plume initially drifted 65 km WNW towards Malekula island. On 6 October the plume became a broad diffuse plume that spread hundreds of kilometers NW across the Coral Sea. Information Contacts: Hawai'i Institute of Geophysics and Planetology (HIGP) Thermal Alerts System, School of Ocean and Earth Science and Technology (SOEST), Univ. of Hawai'i, 2525 Correa Road, Honolulu, HI 96822, USA (URL: http://modis.higp.hawaii.edu/); Wellington Volcanic Ash Advisory Centre (VAAC), Meteorological Service of New Zealand Ltd (MetService), PO Box 722, Wellington, New Zealand (URL: http://www.metservice.com/vaac/, http://vaac.metservice.com/); NASA Earth Observatory (URL: http://earthobservatory.nasa.gov/). In our last report on Ambrym (BGVN: 3411), we described the frequent thermal anomalies from the volcano's active lava lakes during October 2008-September 2009. Satellite imagery in 2009 and 2010 suggested ongoing visible plumes and thermal alerts consistent with active lava lakes. Several satellite images of Vanuatu appear below (figures 21-22). Figure 21. A hazy layer of vog (volcanic fog) overlies Malekula and a few other islands of the Vanuatu archipelago in this natural-color satellite image from 6 October 2009. The source of the vog is Ambrym, a volcano (and island of the same name) in the SE (lower right) corner of this scene. The haze extends over the Coral Sea several hundred kilometers to the NW. Ambrym emits SO2, the gas responsible for the formation of vog, intermittently. The Moderate Resolution Imaging Spectroradiometer (MODIS) aboard NASA's Aqua satellite acquired this natural-color image. NASA image by Jeff Schmaltz, MODIS Rapid Response, NASA Goddard Space Flight Center (the Rapid Response Team provides twice-daily images of this region). Caption by Robert Simmon. Figure 22. Diffuse plumes rise from Gaua volcano (top) and Ambrym volcano (bottom) in the Vanuatu archipelago. Both Gaua and Ambrym are located in the New Hebrides island arc, where the Pacific plate is subducting beneath the Australian plate. This natural-color image was acquired on 2 August 2010, by the Moderate Resolution Imaging Spectrometer (MODIS) aboard NASA's Terra satellite. NASA image by Jeff Schmaltz ; caption by Robert Simmon. Courtesy of NASA Earth Observatory. Based on observations by aircraft pilots, analyses of satellite imagery, and information from the Vanuatu Geohazards Observatory (VGO), the Wellington Volcanic Ash Advisory Center (VAAC) reported that on 8 and 10 August 2010 ash and steam plumes from Ambrym volcano rose to an altitude 6.1 km and drifted W and NW. Ambrym is a major source of SO2 in the Vanuatu Republic. The VGO web site shows daily Vanuatu volcanic sulfur dioxide (SO2) fluxes through a partnership with GNS Science Institute (Taupo, New Zealand) using OMI satellite images. Figure 23 shows a 22 May 2011 satellite image of Ambrym. Similar images were acquired by NASA satellites on 28 March 2011 and on 7 June 2011. On figure 23, a blue-tinged volcanic plume emissions extends from Ambrym to the W. The plume contains vog, a mix of gases and aerosols that is formed when SO2 and other volcanic gases react with sunlight, oxygen, and moisture. Figure 23. A natural-color image showing Ambrym and its W-blowing plume. The image was acquired by MODIS (the Moderate Resolution Imaging Spectroradiometer aboard the Terra satellite) on the morning of 22 May 2011. NASA image by Jeff Schmaltz, MODIS Rapid Response Team, NASA-GSFC. Courtesy of NASA Earth Observatory. Information Contacts: Vanuatu Geohazards Observatory, Department of Geology, Mines and Water Resources of Vanuatu (URL: http://www.vmgd.gov.vu/vmgd/); NASA Earth Observatory (URL: http://earthobservatory.nasa.gov/); MODIS/MODVOLC Thermal Alerts System, Hawai'i Institute of Geophysics and Planetology (HIGP), School of Ocean and Earth Science and Technology (SOEST), Univ. of Hawai'i, 2525 Correa Road, Honolulu, HI 96822, USA (URL: http://modis.higp.hawaii.edu/); Wellington Volcanic Ash Advisory Centre (VAAC), Meteorological Service of New Zealand Ltd (MetService), PO Box 722, Wellington, New Zealand (URL: http://www.metservice.com/vaac/, URL: http://vaac.metservice.com/). In our previous Ambrym report, we described ongoing plumes, some bearing ash rising to over 6 km altitude through early June 2011 (BGVN 36:05). The volcano has been known to contain two molten, turbulent lava lakes since August 1999, and that continues at least through June 2011, which was the last time lava-lake activity was noted in a report by the Vanuatu Geohazards Observatory (VGO). Our reporting observations drew heavily on government reports of 3 April 2009 and 29 July 2013. The former report also discussed water supply and other issues of public health and safety associated with inhabiting an active volcano. Vanuatu is located in the South Pacific NE of Australia (figures 24 and 25). Figure 24. A location map showing Ambrym volcano on Ambrym Island in the South Pacific. Australia is at lower left. On larger map, Ambrym is shown in Vanuatu labeled in red. Map came from Polacci and others (2012). Figure 25. Map of Ambrym emphasizing risk. Green is low hazard, yellow is medium hazard, and red is high hazard for both areas near the crater and along main stream valleys and their lower, less confined areas at low elevation. Note the two craters, Marum and Benbow, both containing active lava lakes. Courtesy of the Government of Vanuatu (from the 3 April 2009 report by the Vanuatu Natural Disaster Committee). 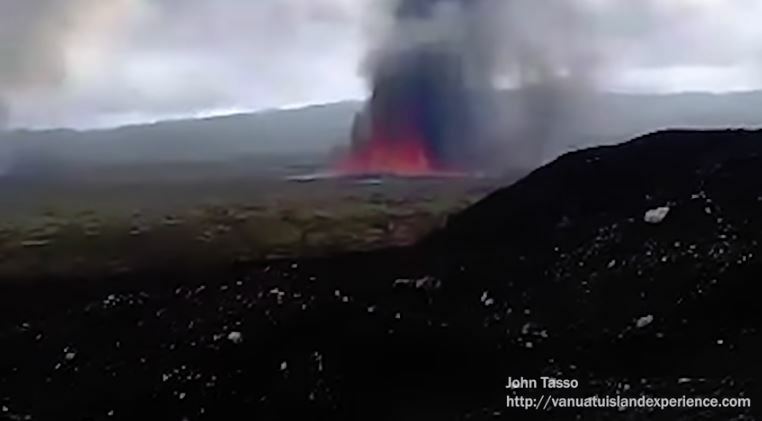 Reynolds (2010) posted videos of lava lake behavior seen in September 2010. Figure 26 is a screenshot taken from the Reynolds' video of the turbulent lava lake with a climber in the foreground. The high definition videos showed an exceedingly agitated lake surface, everywhere disturbed and molten, without any chilled material in evidence. Violent upwellings of lava occurred continuously. Some fraction of the videos show climbers in the foreground, at one point descending a steep slope or vertical drop by a single rope secured from above (abseiling or rappelling). Figure 26. A screen capture from a video of Marum, one of Ambrym's two active lava lakes, taken on unstated day in September 2010. Courtesy of James Reynolds (typhoonfury.com and earthuncut.tv). On 27 June 2011, the VGO reported that data collected from Ambrym's monitoring network showed significant daily degassing and occasional explosions in the crater. Field observers noted that the level of the lava lakes was high. During June, villages reported minor ashfall and that acid rain affected agriculture in general in some areas W, S, and E. The Alert Level remained at 1 (on a scale of 0-4). During the previous 12 months prior to mid-July 2013, MODVOLC thermal alerts were frequent, on the order of several a week to multiple per day, as would be expected for a volcano with active lava lakes. The alerts referred to the lava lakes in Benbow and Marum craters (figure 25). On 21 June 2013, VGO reported that satellite images on 2, 4, 11, 14, and 16 June detected gas emissions from Ambrym. Emissions of minor amounts of ash and substantial amounts of gas from the active vents had been detected during the previous week. The report warned that communities on the island, especially those downwind of Ambrym, may experience ashfall and acid rain that could damage the environment and contaminate water. The Alert Level remained at 1. Based on pilot observations and analyses of satellite imagery, the Wellington Volcanic Ash Advisory Center (VAAC) reported that on 19 July 2013 an ash plume rose to an altitude of 3 km a.s.l. and drifted 185 km NW. VGO reported that activity at Ambrym slightly increased to a minor eruptive phase, and a seismic swarm was detected between 2400 and 0700 on 26 July 2013. The Alert Level remained at 1. Gas fluxes are generally high for Vanuatu volcanoes and have been the subject of regular reporting online and several recent reports in the literature (for example, Bani and others, 2009; Bani and others, 2012). References. Bani, P., C. Oppenheimer, V.I. Tsanev, S.A. Carn, S.J. Cronin, R. Crimp, J.A. Calkins, D. Charley, M. Lardy, and T.R. Roberts, 2009, Surge in sulfur and halogen degassing from Ambrym volcano, Vanuatu, Bulletin of Volcanology, 71(10), 1159-1168, doi:10.1007/s00445-009-0293-7. Bani, P., C. Oppenheimer, P. Allard, H. Shinohara, V. Tsanev, S. Carn, M. Lardy, and E. Garaebeti, 2012, First arc-scale volcanic SO2 budget for the Vanuatu archipelago, Journal of Volcanology and Geothermal Research, 211-212, 36-46, doi:10.1016/j.jvolgeores.2011.10.005. Polacci, M, Baker, D, La Rue, A., Mancini, L., Allard, P., 2012, Degassing behaviour of vesiculated basaltic magmas: an example from Ambrym volcano, Vanuatu Arc, Journal of Volcanology and Geothermal Research, Vol. 233-234, 1 July 2012, pp. 55-64. Reynolds, J., 2010, (Video) Abseiling towards a lava lake--extreme video From Marum volcano, Ambrym, Vanuatu (September 2010) YouTube (URL: https://www.youtube.com/watch?v=AtGT-_7Xoal) [also available at typhoonfury.com and earthuncut.tv]. Information Contacts: Vanuatu Geohazards Observatory, Department of Geology, Mines and Water Resources of Vanuatu (URL: http://geohazards.gov.vu/); Hawai'i Institute of Geophysics and Planetology (HIGP), MODVOLC Thermal Alerts System, School of Ocean and Earth Sciences and Technology (SOEST), Univ. of Hawai'i, 2525 Correa Road, Honolulu, HI 96822, USA (URL: http//hotspot.higp.hawaii.edu/); Wellington Volcanic Ash Advisory Centre (VAAC) (URL: http://vaac.metservice.com/); and NASA Global Sulfur Dioxide Monitoring Home Page, Goddard Space Flight Center, Sciences and Exploration Atmospheric Chemistry and Dynamics Laboratory, Code 614 (URL: http://so2.gsfc.nasa.gov/, http://so2.gsfc.nasa.gov/pix/daily/0813/vanuatu_0813z.html). Our previous report on Ambrym (BGVN 38:05) indicated that daily degassing and an infrequent ash plume occurred through July 2013, along with frequent MODVOLC thermal alerts, consistent with the hot molten surface of the volcano's active lava lakes. The volcano, whose location was shown in the previous report in figure 27, consists of two craters, Marum and Benbow, each with a lava lake. According to the Vanuatu Geohazards Observatory (VGO), the last known eruption was in 2009. The island of Ambrym has ~7,000 inhabitants, many of whom live within the hazard zone (see figure 28 in BGVN 38:05). This report updates information through July 2014. 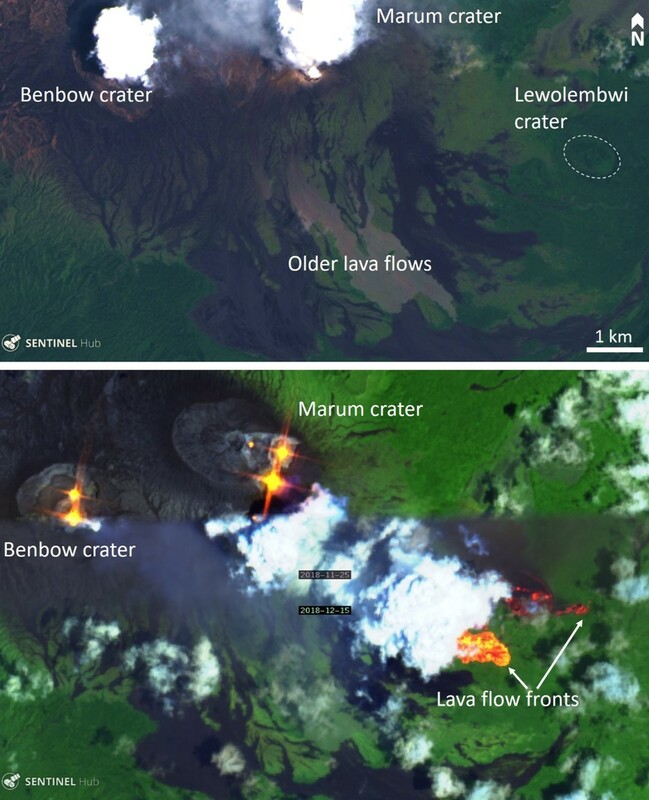 According to NASA's Earth Observatory, a satellite image acquired on 9 August 2013 showed steam-and-gas plumes rising from Ambrym's Benbow cone and from the active lava lake in Mbwelesu Crater (one of three active sub-craters of the Marum cone) (figure 27). Another Earth Observatory image on 7 January 2014 showed a plume from Ambrym spreading across the South Pacific Ocean (figure 28). The strong reflection of the sun off the sea surface is called "sunglint." Figure 27. NASA Earth Observatory satellite image of Ambrym on 9 August 2013. 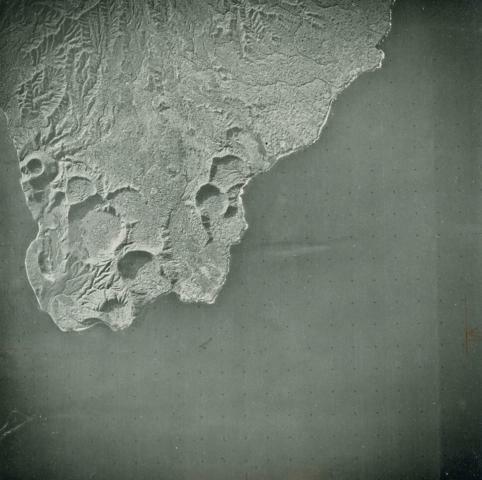 The image shows the two active craters on the volcanic island. According to the caption, deep within Benbow (left) and Marum (right) craters, vents continuously release steam, sulfur dioxide, and other volcanic gases into the atmosphere. These gases frequently stream over the other islands in Vanuatu, along the W edge of the South Pacific. The orange spot in Marum crater is a persistent lava lake. This natural-color image was acquired by the Advanced Land Imager. Courtesy of NASA Earth Observatory (image by Jesse Allen and Robert Simmon, using EO-1 ALI data from the NASA EO-1 team, caption by Robert Simmon). Figure 28. NASA Earth Observatory satellite photo of Ambrym (lower left) on 7 January 2014. In this natural-color image acquired by MODIS aboard the Aqua satellite, a vog plume from Ambrym spreads across the South Pacific. (Vog results when volcanic gases, primarily sulfur dioxide and other oxides of sulfur, react with oxygen and moisture in the presence of sunlight.) Some contribution to the vog may come from Gaua volcano, which the plume passes directly over but there have been no recent reports on events there. Courtesy of NASA (image courtesy Jeff Schmaltz LANCE/EOSDIS MODIS Rapid Response Team, GSFC). As in previous years, MODVOLC thermal alerts during the reporting period were frequent, ranging from several per week to multiple times per day. This activity is consistent with the presence of active lava lakes. According to VGO, the current alert level remains in mid-2014 at 1 (increased activity, danger near crater only). Information Contacts: MODVOLC - HIGP, Hawai'i Institute of Geophysics and Planetology (HIGP), MODVOLC Thermal Alerts System, School of Ocean and Earth Science and Technology (SOEST), Univ. of Hawai'i, 2525 Correa Road, Honolulu, HI 96822, USA (URL: http://modis.higp.hawaii.edu/); NASA Earth Observatory, EOS Project Science Office, NASA Goddard Space Flight Center, Goddard, Maryland, USA (URL: http://earthobservatory.nasa.gov/); and Vanuatu Geohazards Observatory (VGO) (URL: http://www.geohazards.gov.vu). Ambrym is a large basaltic volcano, with two lava lakes (figure 29) that have been almost continuously active since May 2008 contained in the 12-km-wide summit crater; MODIS data shows that they have remained active through at least June 2015. The Vanuatu Geohazards Observatory (VGO) issues periodic updates for the population of ~7000 island residents, and monitors seismicity using one permanent station. It also regularly emits ash plumes affecting air navigation, spreads clouds of vog across the island (BGVN 39:04), and occasionally has reported lava flows. The dramatic nature of the lava lakes makes it a popular destination with volcano tourists. Figure 29. Main crater area of Ambrym volcano showing smaller craters and lava lakes as well as the danger and exclusion zones. Image courtesy of VGO. Steam-and-gas plumes were previously detected in satellite imagery on 9 August 2013 and 7 January 2014 (BGVN 39:04). On 11 September 2014, VGO reported increased seismicity and raised the Alert Level from 1 to 2 (on a scale of 0-4). On 8 December 2014, VGO reported that observations and analyses of Ambrym conducted during November and early December showed that activity levels had slightly decreased and consequently, the Alert Level was lowered to 1. An expedition to the Benbow lava lake by Volcano Discovery in September 2014 confirmed active lava fountaining from the lake. On 21 February 2015, VGO issued a notice reporting an eruption from a new vent; the Alert Level was raised to 3 (on a scale of 0-5, see figure 30). Aura.OMI SO2 data from NASA first shows an anomaly between 0113 and 0255 UTC on 21 February. By 23 February an SO2 plume extending about 800 km WSW past northern New Caledonia is recorded. The plume then drifts ~600 km to the SSE by 25 February as it dissipates. Only the slightest trace is still visible to the SE of the volcano on 26 February. 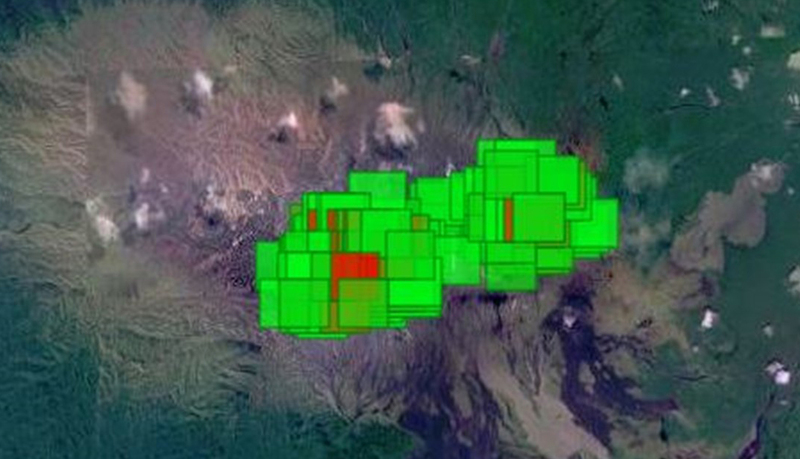 Satellite images indicated that the eruption location was southwest of Lewolembwi crater inside the caldera (figures 29, 31). The LANDSAT images taken in February and March 2015, and compared with an image from May 2014, annotated by Culture Volcan, show the eruption in progress and the extent and distribution of the new lava flow. Figure 30. Vanuatu Volcanic Alert Level descriptors as of February 2015. Courtesy of VGO. Figure 31. LANDSAT images of Ambrym eruption of 20/21 February, 2015. Upper and lower left images are both 24 May 2014, before the eruption. Upper right image taken 20 February 2015, shows ash plume and lava flow in progress. Lower right image from 24 March 2015, shows area of new flow outlined in white and labelled "Nouveau champ de lave". Images Courtesy of LANDSAT 8 OLI/NASA-USGS and Culture Volcan, Annotations courtesy of Culture Volcan. Culture Volcan reported that the Vanuatu National Disaster Management Office (NDMO) visited Ambrym on 22 February 2015. Ben Clark, Chief Pilot for Vanuatu Helicopters, photographed the new lava flow (figure 32), and lava fountains from the eruption in progress (figure 33). Figure 32. The new lava flow at Ambrym was photographed by Ben Clark on 22 February 2015 (right), here compared with a Google Earth image from 2013 (left). Image and annotations courtesy of Culture Volcan. Figure 33. Lava fountains on Ambrym volcano, 22 February 2015. Marum lava lake in upper left, lava fountains and ash plume inside white box. Photo courtesy Ben Clark, annotations courtesy Culture Volcan. MODVOLC data from 21 February shows a large thermal anomaly in the SE quadrant of the large crater which was no longer visible by 23 February. This could be from vegetation fires associated with the new lava flow, and suggests that it only flowed actively for ~ 2 days. Culture Volcan reported that the Wellington VAAC had noted a 2-km-high ash plume on 21 February. On 2 March 2015, VGO reported that activity at Ambrym had slightly decreased but remained elevated, and the Alert Level was lowered to 2. By 25 April 2015 Satellite imagery showed only a steam-and-ash plume drifting W from the two active craters (figure 34). Figure 34. NASA Earth Observatory acquired this image on 25 April 2015 from the Operational Land Imager (OLI) on Landsat 8. The top image shows the plume extending over the South Pacific Ocean toward Malekula. The bottom image shows a close up of the plume over two craters Benbow (left) and Marum (right). Image by Jesse Allen, caption by Kathryn Hansen. Courtesy NASA Earth Observatory. Information Contacts: Vanuatu Geohazards Observatory (VGO), Geo-Hazards office, Vanuatu Meteorology and Geo-Hazards Department (URL: http://www.vmgd.gov.vu/vmgd/); Wellington Volcanic Ash Advisory Centre (VAAC), Meteorological Service of New Zealand Ltd (MetService), PO Box 722, Wellington, New Zealand (URL: http://vaac.metservice.com/); Volcano Discovery (URL: https://www.volcano-adventures.com/photos/vanuatu/tour/2014/marum-bembow-lavalakes.html); NASA Global Sufur Dioxide Monitoring Page (URL: https://so2.gsfc.nasa.gov/); Culture Volcan: Journal d'un volcanophile (URL: http://laculturevolcan.blogspot.fr/); Hawai'i Institute of Geophysics and Planetology (HIGP), MODVOLC Thermal Alerts System, School of Ocean and Earth Science and Technology (SOEST), Univ. of Hawai'i, 2525 Correa Road, Honolulu, HI 96822, USA (URL: http://modis.higp.hawaii.edu/); NASA Earth Observatory, EOS Project Science Office, NASA Goddard Space Flight Center, Goddard, Maryland, USA (URL: http://earthobservatory.nasa.gov/). Ambrym, a volcanic island in the archipelago of Vanuatu with a large caldera (figure 35) is frequently active. Since at least 2001 the caldera has been the site of two lava lakes (BGVN 29:06, 32:05, and 40:06). The Vanuatu Geohazards Observatory (VGO) is responsible for monitoring the volcano, and the Wellington Volcanic Ash Advisory Center (VAAC) tracks ash plumes to provide aviation warnings. Figure 35. 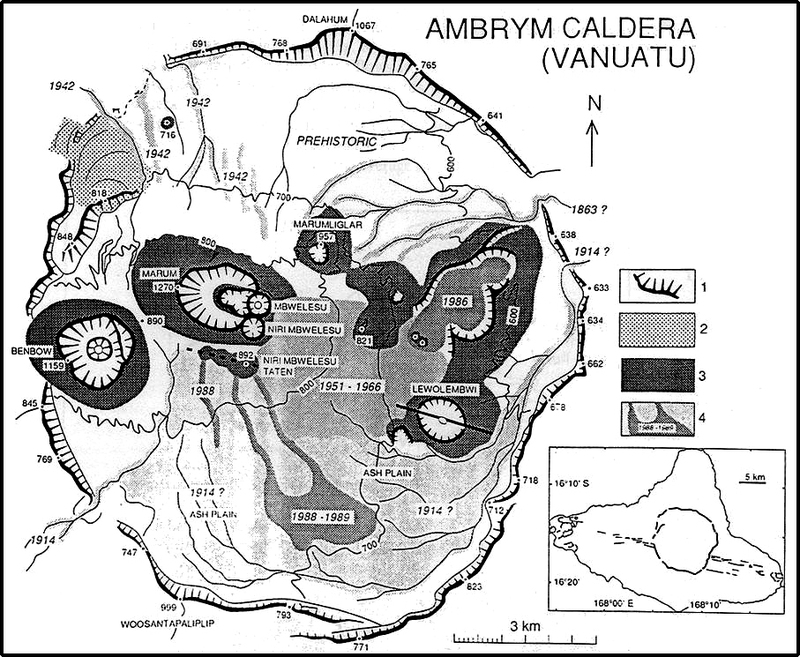 Map of the Ambrym caldera showing features and lava flows through 1989. The insert shows an outline of the island with a fracture zone passing through an outline of the circular caldera in the center of the triangular island. Courtesy of Stromboli Online; original source unknown. On 21 February 2015 the VGO issued a notice reminding the public that a minor eruption was occurring from a new vent inside the caldera. The Alert Level was raised from 2 to 3 (on a new scale of 0-5; see figure 30 in BGVN 40:06). Hazardous areas were near and around the active vents (Benbow, Maben-Mbwelesu, Niri-Mbwelesu and Mbwelesu), and downwind areas prone to ashfall. VGO reported both on 2 March 2015 and 27 May 2016 that activity at Ambrym had slightly decreased but remained elevated. The Alert Level was lowered to 2. Areas deemed hazardous were near and around the active vents, and in downwind areas prone to ashfall. The Wellington VAAC reported that low-level ash emissions from Ambrym were identified in satellite images on 12 July 2016, 11-13 October 2016, and 3 April 2017. MODIS satellite thermal sensors have measured nearly continuous thermal anomalies over the past year ending in mid-April 2017, evident in both MIROVA (figure 36) and MODVOLC data (figure 37); similar levels of thermal anomalies are present in MODVOLC records since 2009. Figure 36. Plot of MODIS thermal infrared data analyzed by MIROVA showing log radiative power for Ambrym for the year ending 18 April 2017. Courtesy of MIROVA. Figure 37. MODVOLC thermal alerts measured during mid-January to mid-April 2017, as an example of similar densities of thermal alerts since about 2009. More than approximately 160 thermal alert pixels (red/orange squares) for this 3-month period are centered over the Marum and Benbow craters. Courtesy of (HIGP), MODVOLC Thermal Alerts System. Information Contacts: Vanuatu Geohazards Observatory (VGO), Geo-Hazards office, Vanuatu Meteorology and Geo-Hazards Department (URL: http://www.vmgd.gov.vu/vmgd/); Wellington Volcanic Ash Advisory Centre (VAAC), Meteorological Service of New Zealand Ltd (MetService), PO Box 722, Wellington, New Zealand (URL: http://vaac.metservice.com/); Hawai'i Institute of Geophysics and Planetology (HIGP), MODVOLC Thermal Alerts System, School of Ocean and Earth Science and Technology (SOEST), Univ. of Hawai'i, 2525 Correa Road, Honolulu, HI 96822, USA (URL: http://modis.higp.hawaii.edu/); MIROVA (Middle InfraRed Observation of Volcanic Activity), a collaborative project between the Universities of Turin and Florence (Italy) supported by the Centre for Volcanic Risk of the Italian Civil Protection Department (URL: http://www.mirovaweb.it/); Stromboli Online (URL: http://www.swisseduc.ch/stromboli/perm/van/links-en.html). Occasional weak eruptions and low-level ash emissions are typical of activity at Ambrym. The most recent ash emission was on 3 April 2017 (BGVN 42:05). The current report summarizes activity from late April through December 2017. On 30 August 2017, the Vanuatu Meteorology and Geo-Hazards Department (VMGD) reported that "drastic changes" at Ambrym prompted an increase in the Alert Level from 2 to 3 (on a scale of 0-5). Areas deemed hazardous were near and around the active vents (Benbow, Maben-Mbwelesu, Niri-Mbwelesu and Mbwelesu), and in downwind areas prone to ashfall. According to a news report (Radio New Zealand), a representative of VMGD indicated that the Alert Level change was based on increased seismicity detected since the beginning of August, but which became more notable on 25 August. According to VMGD, aerial observations on 24 and 30 September, and 1 and 6 October, combined with analysis of seismic data, confirmed that minor eruptive activity within the caldera was characterized by hot volcanic gas and steam emissions. Areas deemed hazardous were within a 2-km radius from Benbow Crater and a 3-km radius from Marum Crater. A news report (The Vanuatu Independent) quoted an official from VMGD as stating that on 8 November 2017 at 0500, the Niri-Mbwelesu eruptive vent emitted a minor ash plume. On 7 December 2017, VGO lowered the Alert Level to 2, noting that activity had stabilized by the end of November and was characterized by gas-and-steam emissions. Seismicity had also declined. 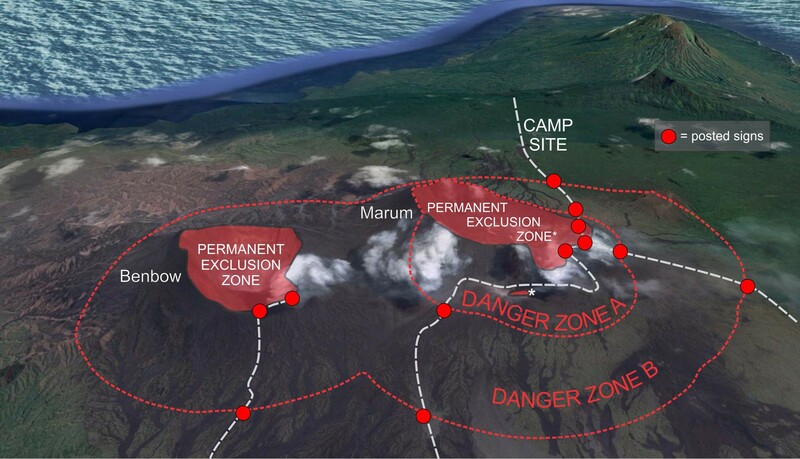 The report reminded the public to stay outside of the Permanent Danger Zone, defined as a 1-km radius from Benbow Crater and a 2.7-km radius from Marum Crater. During the reporting period, thermal anomalies based on MODIS satellite instruments and analyzed using the MODVOLC algorithm, continued to be numerous every month, possibly reflecting lava lakes in Benbow and Marum craters. 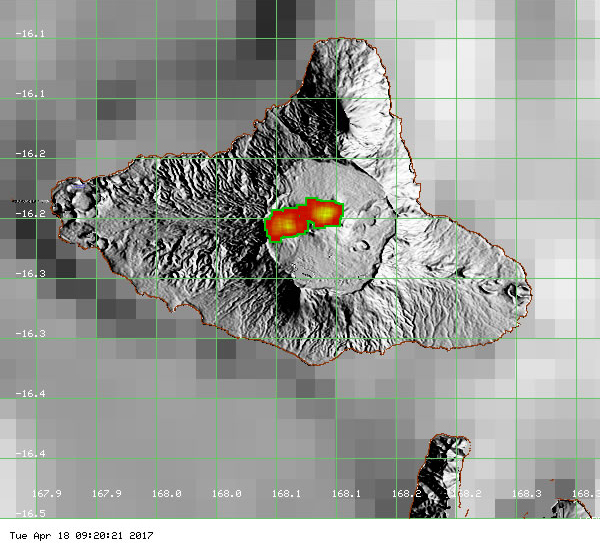 The MIROVA (Middle InfraRed Observation of Volcanic Activity) system also detected numerous hotspots every month within 5 km of the volcano. Information Contacts: Geo-Hazards Division, Vanuatu Meteorology and Geo-Hazards Department, Ministry of Climate Change Adaptation, Meteorology, Geo-Hazards, Energy, Environment and Disaster Management, Private Mail Bag 9054, Lini Highway, Port Vila, Vanuatu (URL: http://www.vmgd.gov.vu/, https://www.facebook.com/VanuatuGeohazardsObservatory/); Radio New Zealand (URL: https://www.radionz.co.nz); The Vanuatu Independent (URL: https://vanuatuindependent.com/); Hawai'i Institute of Geophysics and Planetology (HIGP), MODVOLC Thermal Alerts System, School of Ocean and Earth Science and Technology (SOEST), Univ. of Hawai'i, 2525 Correa Road, Honolulu, HI 96822, USA (URL: http://modis.higp.hawaii.edu/); Middle InfraRed Observation of Volcanic Activity (MIROVA), Mirova (collaborative project between the Universities of Turin and Florence, Italy)(URL: http://www.mirovaweb.it). Ambrym volcano, located in Vanuatu along the New Hebrides Island Arc, consists of a large 12-km-diameter caldera with two active craters, Marum and Benbow. Historical activity has occurred at summit and flank vents, producing moderate explosive eruptions and lava flows that reach the coast. Historically important eruptions date back two centuries, including extra-caldera W-flank lava flows that caused destruction in coastal areas in 1820, 1894, 1913, and 1929. Since then, there have not been extra-caldera lava eruptions, although the areas around Marum and Benbow craters remain hazardous. The Vanuatu Meteorology and Geo-Hazards Department (VMGD) located in Port Vila, Vanuatu, is responsible for monitoring ongoing activity at Ambrym. During January through June 2018, volcanic activity was confined to the eruptive vents of Benbow and Marum craters, including ongoing lava lake activity inside the active vents, substantial degassing, and emission of steam clouds. The Volcanic Alert Level remained at Level 2 on a scale from 0 to 5 with five being the highest (figure 30). At Level 2 ('Major Unrest') the danger is restricted to the active craters and the Permanent Exclusion Zones, which are located within a 1 km radius around Benbow crater and about a 2.7 km radius around Marum crater (figure 38). Figure 38. A "Safety Map" showing Benbow and Marum craters at Ambrym with the locations of both designated permanent exclusion zones and danger zones. Courtesy of Vanuatu Meteorology and Geo-Hazards Department. VMGD reported that the lava lakes in Benbow and Marum craters continued to be active and produced gas and steam emissions on 30 January, 19 March, and 25 April 2018. More sustained and substantial emissions were reported on 7 June. During the reporting period, numerous thermal anomalies were detected by the MODIS satellite instruments and subsequently analyzed using the MODVOLC algorithm, possibly reflecting lava lake activity in Benbow and Marum craters (figures 39 and 40). The MIROVA (Middle InfraRed Observation of Volcanic Activity) system also detected numerous hotspots almost every day (figure 41). Figure 39. Showing two active craters of Ambrym, Benbow and Marum. Red areas indicate approximate locations of Thermal Anomaly detections with the number of detections from MODVOLC Thermal Alert System from the period January through June 2018. Courtesy of HIGP - MODVOLC Thermal Alerts System. Figure 40. MODVOLC thermal alerts detected during the reporting period from January to June 2018 showing hot spots located at Benbow and Marum craters. Courtesy of HIGP - MODVOLC Thermal Alerts System. Figure 41. Plot of MODIS thermal infrared data analyzed by MIROVA showing the log radiative power of thermal anomalies at Ambrym for the year ending on 29 August 2018. Courtesy of MIROVA. Information Contacts: Geo-Hazards Division, Vanuatu Meteorology and Geo-Hazards Department (VMGD), Ministry of Climate Change Adaptation, Meteorology, Geo-Hazards, Energy, Environment and Disaster Management, Private Mail Bag 9054, Lini Highway, Port Vila, Vanuatu (URL: http://www.vmgd.gov.vu/, https://www.facebook.com/VanuatuGeohazardsObservatory/); Hawai'i Institute of Geophysics and Planetology (HIGP) - MODVOLC Thermal Alerts System, School of Ocean and Earth Science and Technology (SOEST), Univ. of Hawai'i, 2525 Correa Road, Honolulu, HI 96822, USA (URL: http://modis.higp.hawaii.edu/); MIROVA (Middle InfraRed Observation of Volcanic Activity), a collaborative project between the Universities of Turin and Florence (Italy) supported by the Centre for Volcanic Risk of the Italian Civil Protection Department (URL: http://www.mirovaweb.it/). Ambrym, a large basaltic volcano with a 12-km-wide caldera, is one of the most active volcanoes of the New Hebrides arc. A thick, almost exclusively pyroclastic sequence, initially dacitic, then basaltic, overlies lava flows of a pre-caldera shield volcano. The caldera was formed during a major plinian eruption with dacitic pyroclastic flows about 1900 years ago. Post-caldera eruptions, primarily from Marum and Benbow cones, have partially filled the caldera floor and produced lava flows that ponded on the caldera floor or overflowed through gaps in the caldera rim. Post-caldera eruptions have also formed a series of scoria cones and maars along a fissure system oriented ENE-WSW. Eruptions have apparently occurred almost yearly during historical time from cones within the caldera or from flank vents. However, from 1850 to 1950, reporting was mostly limited to extra-caldera eruptions that would have affected local populations. Bani P, Oppenheimer C, Tsanev V I, Carn S A, Cronin S J, Crimp R, Calkins J A, Charley D, Lardy M, Roberts T R, 2009. Surge in sulphur and halogen degassing from Ambrym volcano, Vanuatu. Bull Volcanol, 71: 1159-1168. Carniel R, Di Cecca M, Rouland D, 2003. Ambrym, Vanuatu (July-August 2000): spectral and dynamical transitions on the hours-to-days timescale. J. Volcanol. Geotherm. Res., 128: 1-13. Eissen J-P, Monzier M, Robin C, Picard C, Douglas C, 1990. Report on the volcanological field work on Ambrym and Tanna Islands (Vanuatu) from 2 to 25 September 1990. Orstom (Noumea) Rapport Missions Sci Terre Geol-Geophys, 22: 1-22. Green J, Short N M, 1971. Volcanic Landforms and Surface Features: a Photographic Atlas and Glossary. New York: Springer-Verlag, 519 p.
Gregory J W, 1917. The Ambrym eruptions of 1913-14. Geol Mag, 4: 529-540. McCall G J H, LeMaitre R W, Malahoff A, Robinson G P, Stephenson P J, 1970. The geology and geophysics of the Ambrym Caldera, New Hebrides. Bull Volcanol, 34: 681-696. Monzier M, Danyushevsky L V, Crawford A J, Bellon H, Cotton J, 1993. High-Mg andesites from the southern termination of the New Hebrides island arc (SW Pacific). J. Volcanol. Geotherm. Res., 57: 193-217. New Hebrides Geological Survey, 1976. Geology of Pentecost and Ambrym. New Hebrides Geol Surv, 1:100,000 geol map sheet 6. Smithsonian Institution-SEAN, 1975-89. [Monthly event reports]. Bull Scientific Event Alert Network (SEAN), v 1-14. Stephenson P J, McCall G J H, LeMaitre R W, Robinson G P, 1968. The Ambrym Island Research Project. New Hebrides Geol Surv Ann Rpt 1966, p 9-15. There is data available for 55 Holocene eruptive periods. 1938 Unknown Confirmed 2 Historical Observations Benbow, Marum ? 1912 Unknown Confirmed Historical Observations Marum ?, west flank ? There is no Deformation History data available for Ambrym. There is data available for 4 emission periods. Expand each entry for additional details. This vertical aerial photo shows part of the 12-km-wide summit caldera of Ambrym volcano, one of the most active of the New Hebrides arc. The two steaming craters at the lower left are Marum (top) and Benbow (bottom). The caldera was formed during a major plinian eruption with dacitic pyroclastic flows about 1900 years ago. Post-caldera eruptions, primarily from Marum and Benbow cones, have partially filled the caldera floor and also formed a series of scoria cones and maars along a fissure system oriented ENE-WSW. Photo by Royal Air Force (published in Green and Short, 1971). Ambrym was observed during a September 5-18, 1990 visit to Vanuatu to be ejecting ash and blocks from Niri Mbwelesu crater, which formed adjacent to Mbwelesu crater in 1989. Mbwelesu was also active. It appeared more elongated than represented on 1989 maps and no longer contained a lava lake. Mbwelesu, Niri Mbwelesu, and Niri Mbwelesu Taten craters remained more or less constantly active into 1991. Photo by Michel Lardy, 1990 (ORSTROM, Vanuatu). An explosive eruption that ejected ash and blocks from Niri Mbwelesu crater was observed on September 16, 1990. The Niri Mbwelesu crater formed adjacent to Mbwelesu crater in 1989. Mbwelesu was also active at that time and appeared more elongated than represented on 1989 maps and no longer contained a lava lake. During 1990, activity was concentrated in Mbwelesu, Niri Mbwelesu and Niri Mbwelesu Taten craters; activity remained more or less constant into 1991. Photo by Michel Lardy, 1990 (ORSTROM, Vanuata). A series of basaltic tuff rings occupy the western tip of Ambrym Island, at the subaerial end of a fissure system that cuts across the length of the island. The largest tuff ring is about 1 km in diameter. The tuff rings were produced by phreatic eruptions when magma contacted the water table or near-surface, water-saturated sediments along the coast. At higher elevations along the rift zone, cinder cones predominate. Photo by Hunting Surveys, London (published in Green and Short, 1971). On May 27, 1988, this lava lake was observed in Mbwelesu's crater, which along with Marum, was emitting dark gray clouds. Airline pilots had earlier reported ash clouds below 12-km altitude from Benbow on February 13. Vanuatu geologists reported only increased activity from Benbow during February 12-14, after which the volcano returned to normal. On August 9-10 lava flows that traveled towards the southern caldera wall were emitted from a new cone, Niri Taten, that formed on the south flank of Marum. This eruption ended on August 23. Photo by Alain Melchior, 1988. Incandescent spatter rises from a new lava lake at vent C of Mbwelesu crater at Ambrym volcano on August 28, 1999. Mbwelesu crater was contructed at the eastern rim of Marum crater in the west-central part of the 12-km-wide summit caldera of Ambrym. More frequent lava lake activity had been reported from several craters within the caldera since at least 1996 through the end of the century. Lava lake activity had also been previously noted by infrequent visitors to the summit caldera during late late 1980s and the early 1990s. Photo by John Seach, 1999. The ash-mantled slopes of the northern side of Marum cone are cut by erosional gulleys. Marum is one of several historically active pyroclastic cones constructed with the 12-km-wide caldera; it lies in the west-central part of the caldera and at 1270 m is the highest of the post-caldera cones. Erosional gullies in fresh ash deposits dissect the northern slopes of Benbow, one of many pyroclastic cones in the summit caldera of Ambrym volcano. This large basaltic volcano is one of the most active in the New Hebrides arc. The 12-km-wide caldera was formed during a major plinian eruption with dacitic pyroclastic flows about 1900 years ago. Post-caldera eruptions, primarily from Marum and Benbow cones, have partially filled the caldera floor and produced lava flows that ponded on the caldera floor or overflowed through gaps in the caldera rim. Copyrighted photo by Marco Fulle, 2000 (Stromboli On-Line, http://stromboli.net). The steep-walled craters of the Marum cone complex at the summit of Ambrym volcano are seen from the east. Ambrym, a large basaltic volcano with a 12-km-wide caldera, is one of the most active volcanoes of the New Hebrides arc. A thick, pyroclastic sequence, initially dacitic, then basaltic, overlies lava flows of a pre-caldera shield volcano. Post-caldera eruptions, primarily from Marum and Benbow cones, have partially filled the caldera floor and produced lava flows that ponded on the caldera floor or overflowed through gaps in the caldera rim. Photo by Karoly Nemeth, 2005 (Massey University). A lava lake is visible inside Mbwelesu crater within Marum cone at Ambrym on June 7, 2007. Lava lake activity was observed during a field expedition from May to June. MODIS thermal alerts had resumed at Ambrym since November, 2006, and ash eruptions took place in April and March, 2007. Photo by Steven Clegg, 2007. There are no samples for Ambrym in the Smithsonian's NMNH Department of Mineral Sciences Rock and Ore collection. Large Eruptions of Ambrym Information about large Quaternary eruptions (VEI >= 4) is cataloged in the Large Magnitude Explosive Volcanic Eruptions (LaMEVE) database of the Volcano Global Risk Identification and Analysis Project (VOGRIPA).